We are a couple who love to travel the world! Occasionally, there just isn’t enough time to take in an entire city over a week or two. 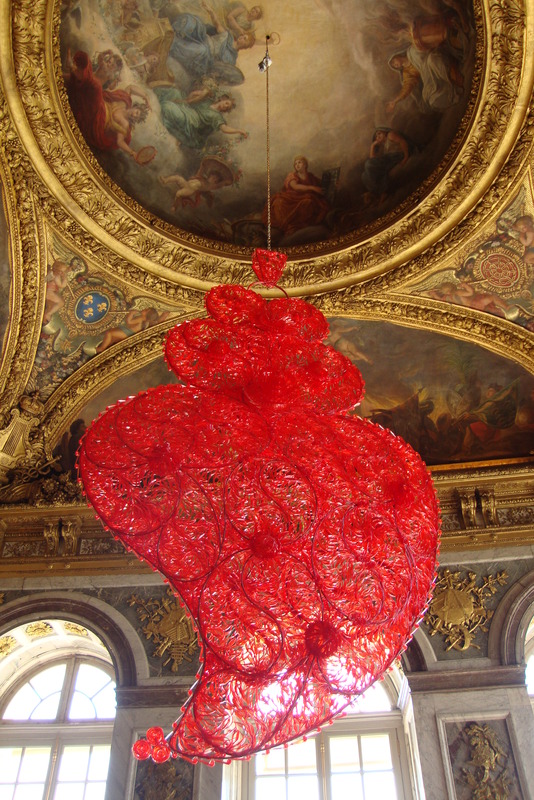 Sometimes you only have a day or two before having to say “au revoir”. 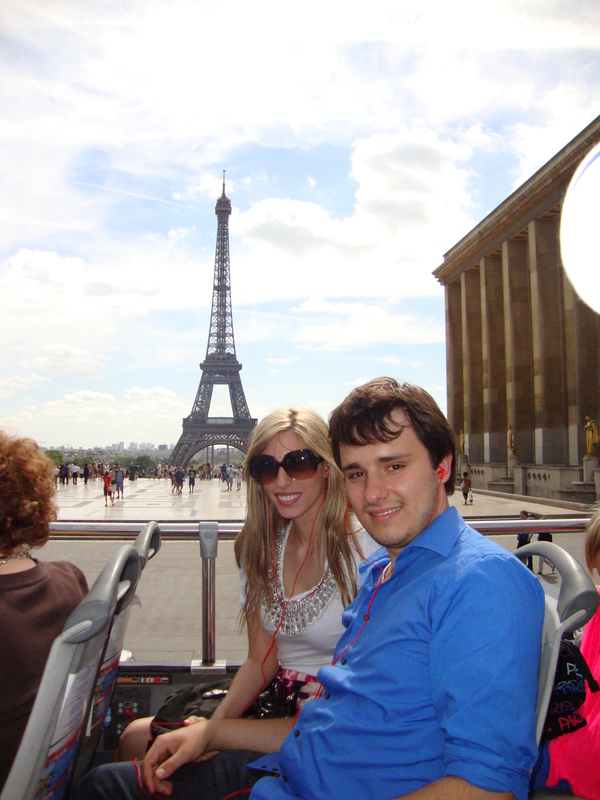 Luckily, it’s easy to get a brief introduction to Paris using the hop-on, hop-off bus tours. There are a few different companies that offer these tours around the city. We got our tickets through viator.com, since we’ve used them before and had good experiences. 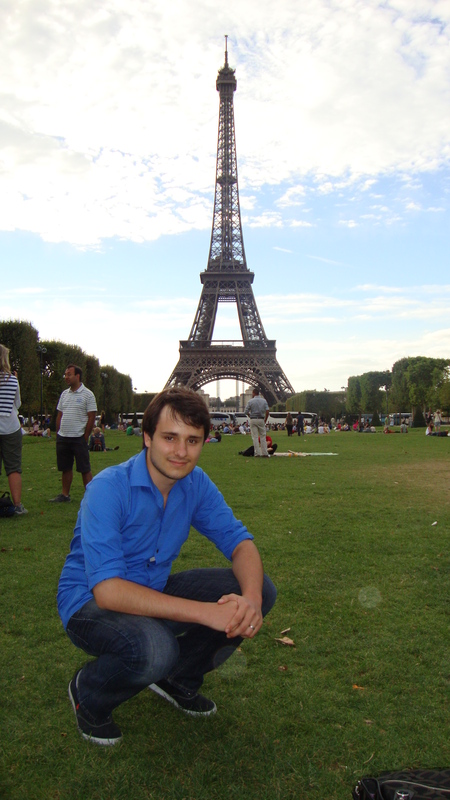 When Alex and I came to Paris last summer, we had only three days to spend there as part of a larger European vacation. 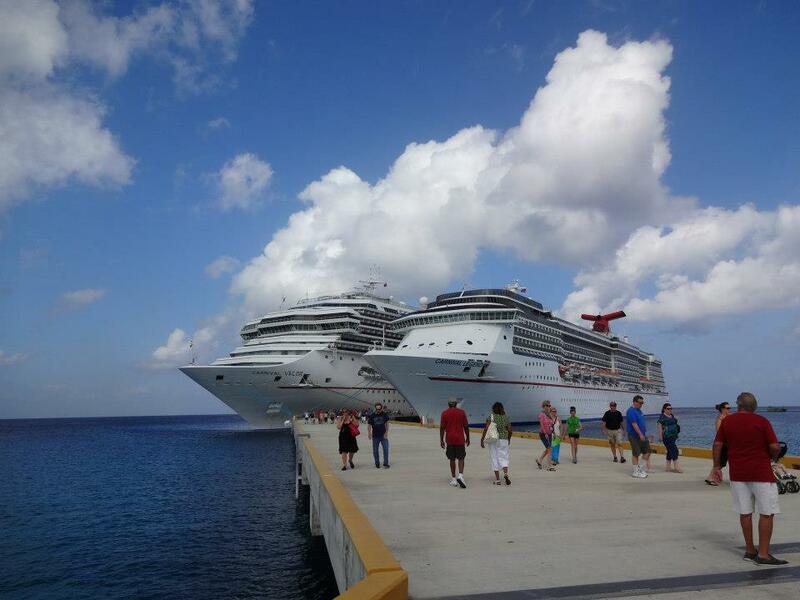 Being so limited on time, the hop-on, hop-off tours were a great decision for us. 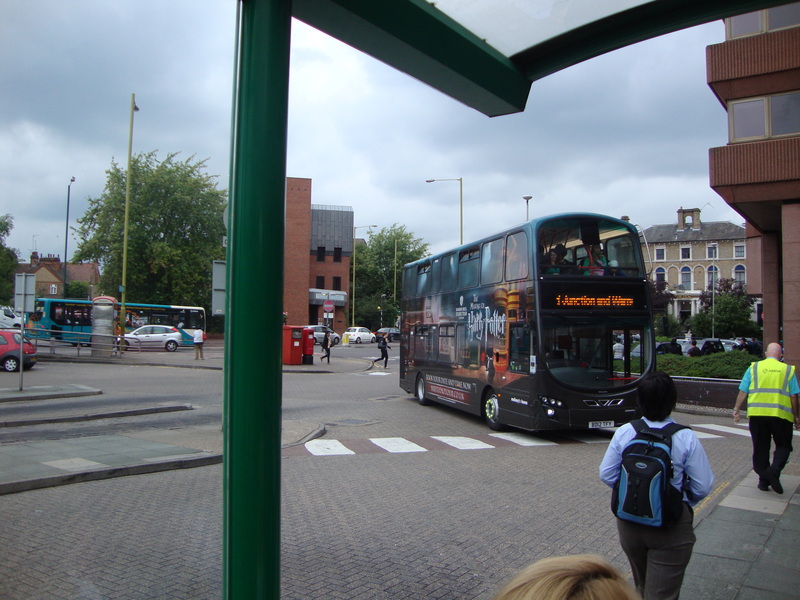 The buses stop at various points around the city and provide a free audio tour. You have the option to stay on the bus and take the whole route, or get off at different places along the way. The buses come by every 15-20 minutes, so you can take as long as you’d like at any given stop before joining the bus tour again. It’s actually a great alternative to public transportation if you are only planning to go to the major “tourist” spots. It gets you around the city quickly and makes enough stops that you will never have to walk too far. The passes are good for an entire day, so there’s also no limit to the number of times you can get on or off. 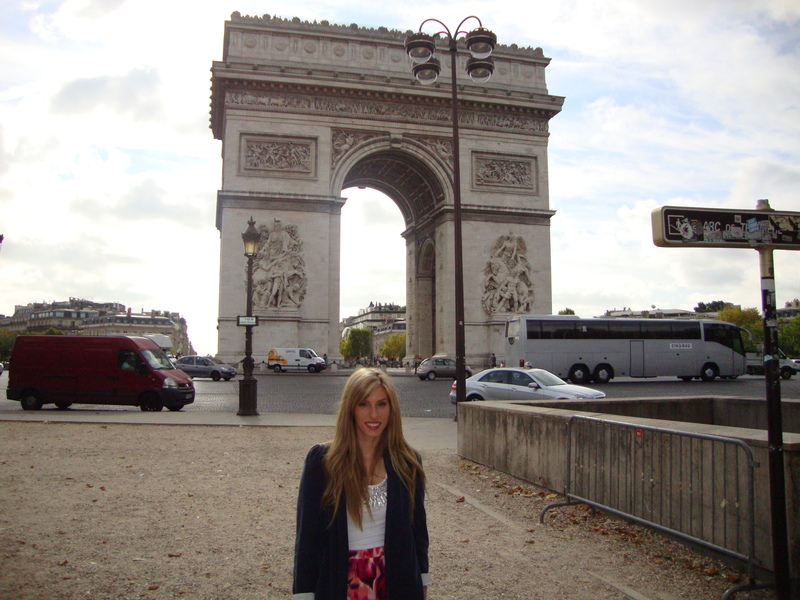 We boarded the bus at the Arc de Triomphe. You can get on the bus at any of the stops on the route, but we chose to start here since it happened to be closest to our hotel. 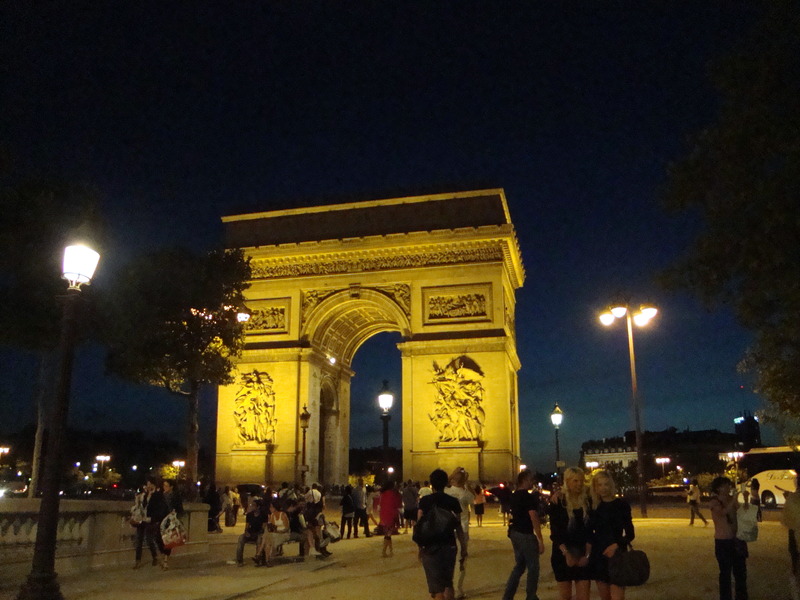 Our bus circled the Arc and cruised down the Champs-Élysées. 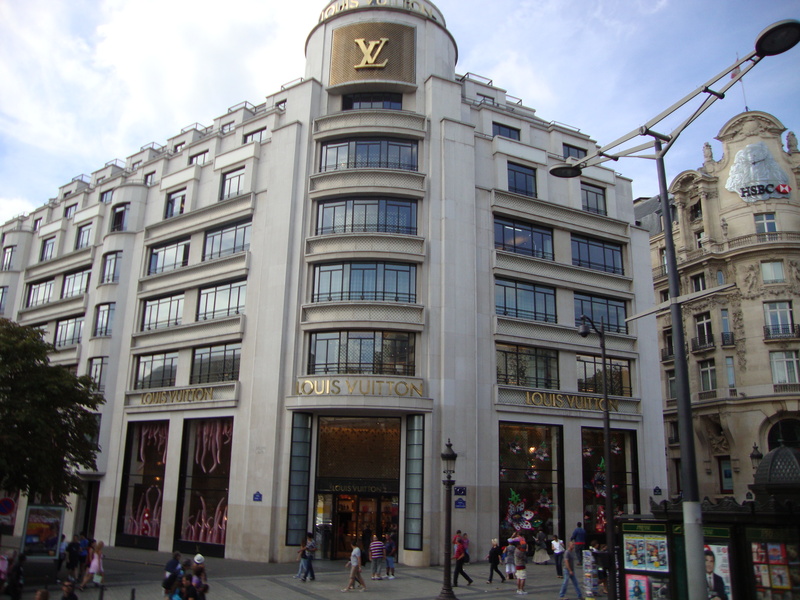 This is the street with high-end shopping and a ton of great restaurants. 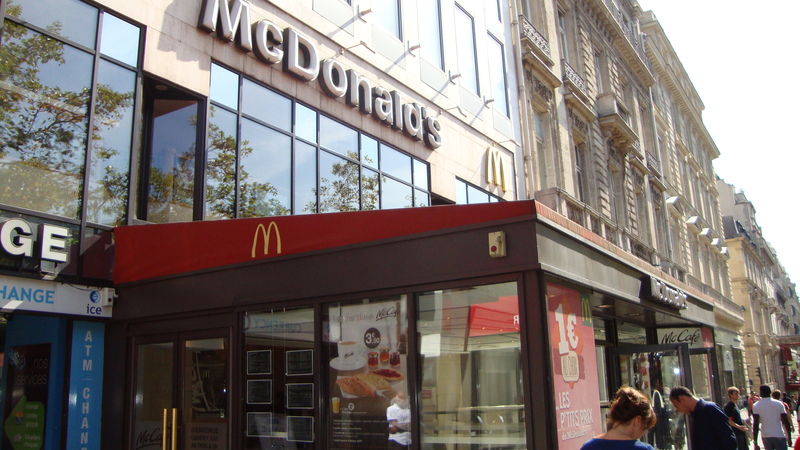 Even their McDonald’s was “fancy”…it was the first time I’ve seen a separate McCafe inside the restaurant. 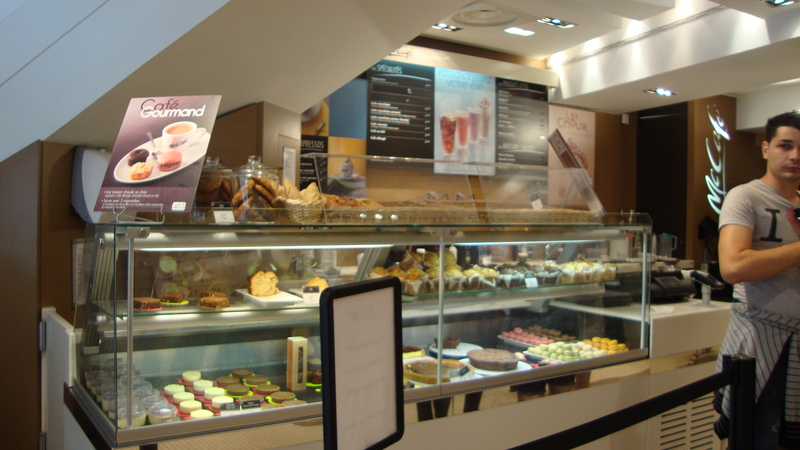 They sold multi-colored macarons and other French bakery items. 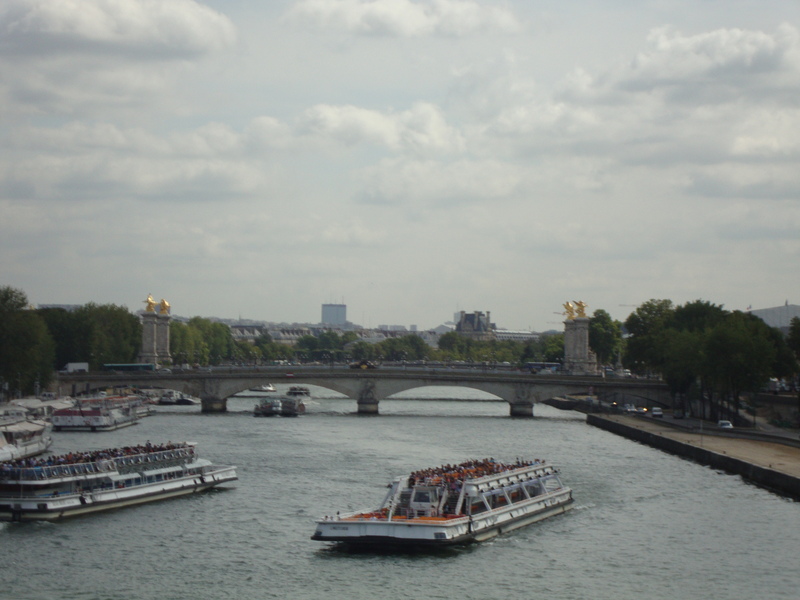 After driving down the Champs-Élysées, our bus crossed the Seine River on the way towards the Eiffel Tower. If you have a free afternoon, I’d highly recommend going on river cruise here. From personal experience, it’s a lot of fun and an interesting way to see the city. The views from the boat are magical at nighttime. 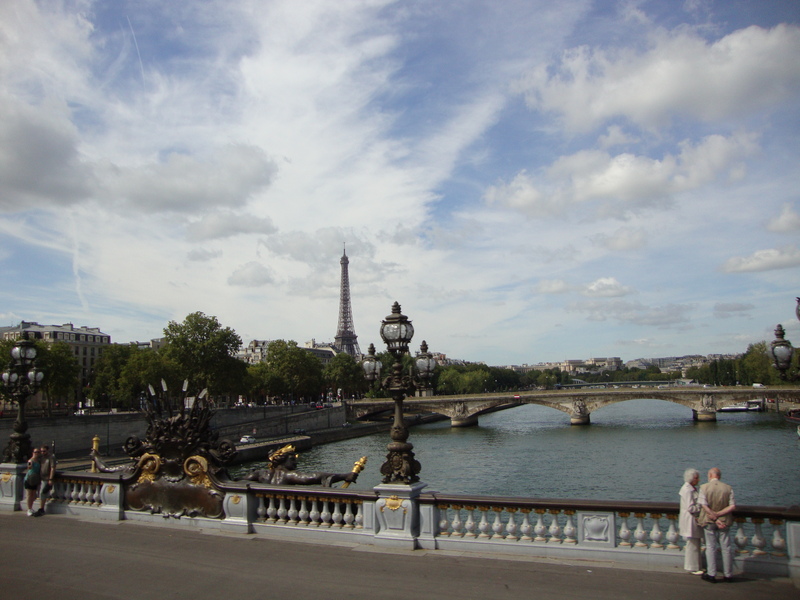 One of the best views of the Eiffel Tower is from the plaza called the Trocadero. It’s up on a hill, offering spectacular views. 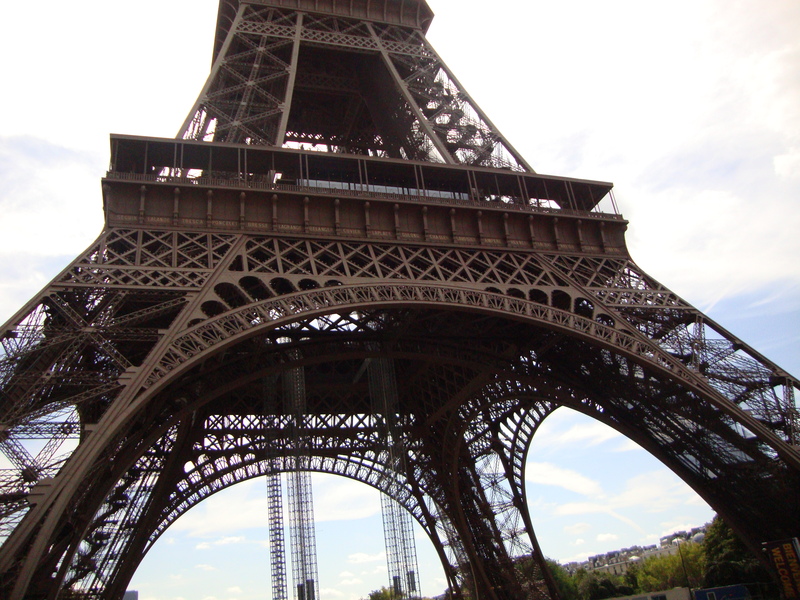 Most people take their “official” Eiffel Tower pic from here, since it’s just far enough to capture the entire tower unobstructed. We took this picture from the bus while it was stopped. I think it turned out pretty well! 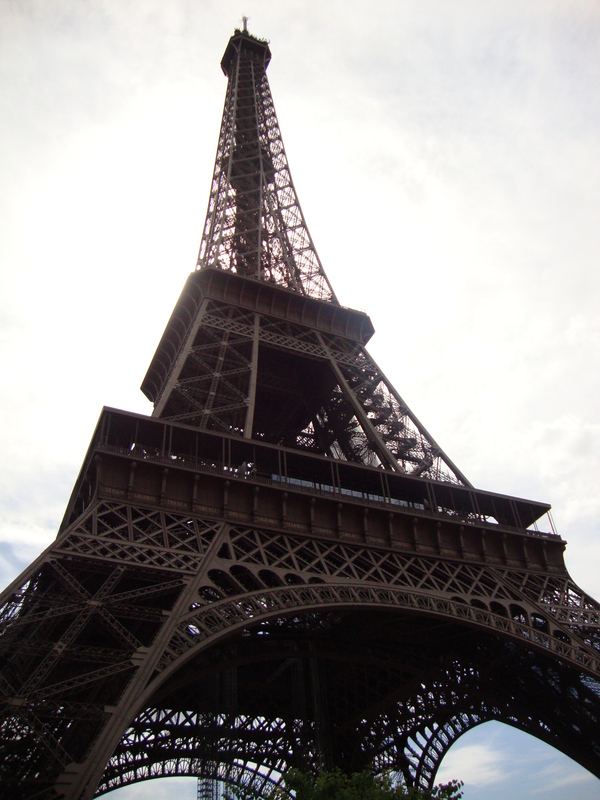 Don’t worry that this is the closest you can get…the bus also stops right in front of the Eiffel Tower. You can go up towards the top of the tower and even eat at the restaurant inside, but on this particular day the line to go up was at least an hour long. Having been up inside the Eiffel Tower before, we decided to skip it and enjoy some ice cream on the lawn instead. We had just as much fun and at little cost. 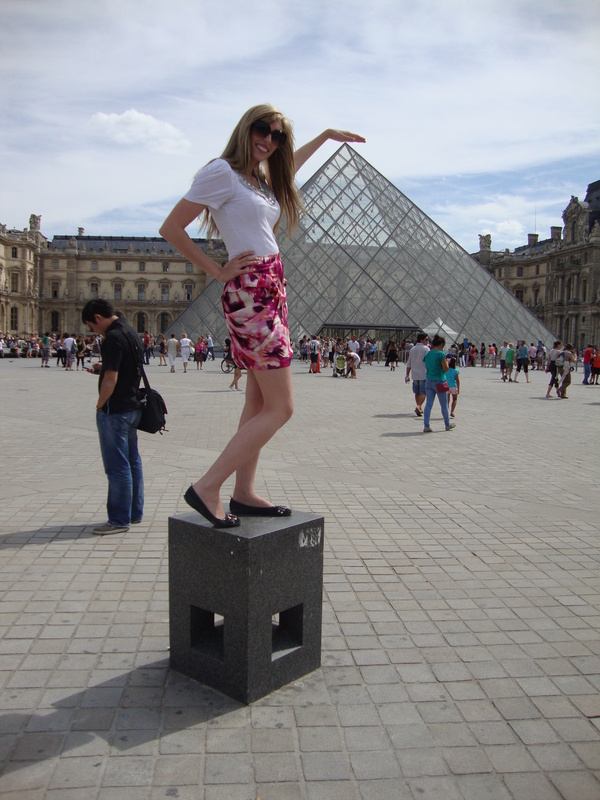 The bus tour also stops at the Louvre. It would take several days to see everything here, so we’re not going to pretend that we saw a lot. 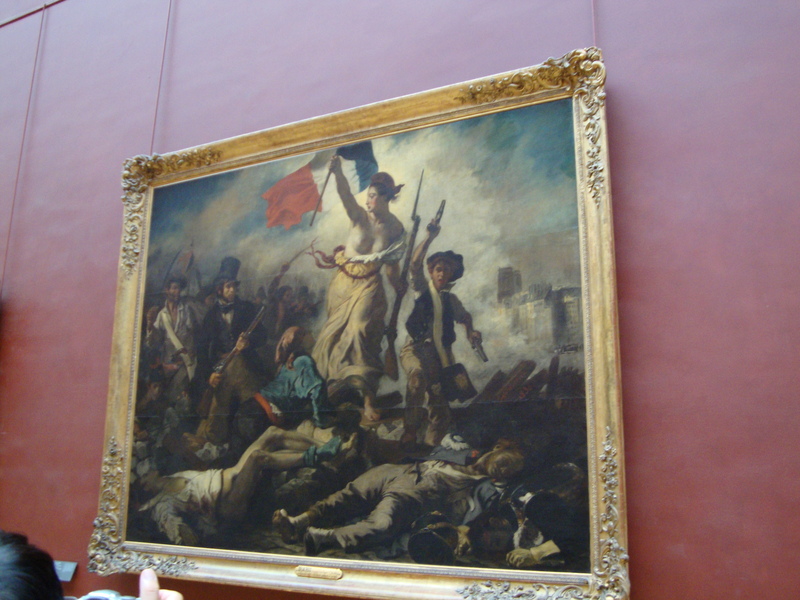 But we did spent the good part of our day here, and got to appreciate many phenomenal pieces of art. 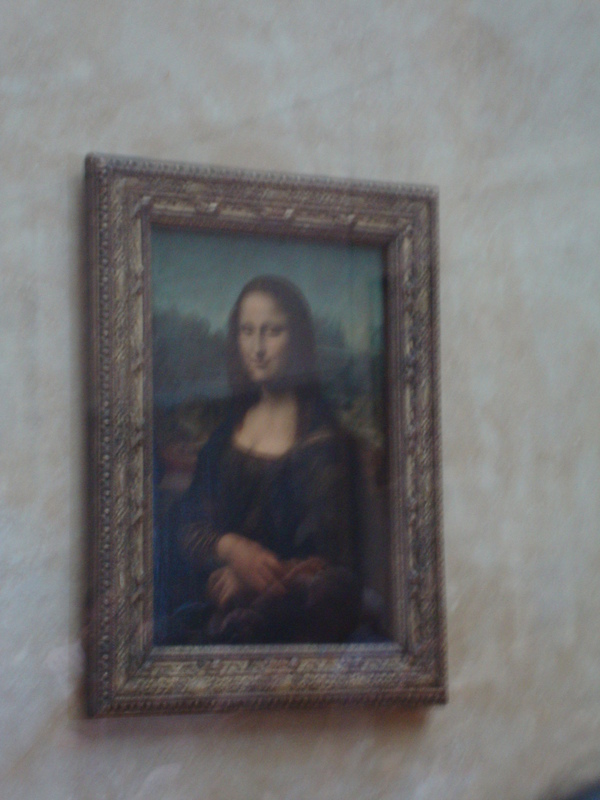 By the way, you CAN take pictures inside, just not with a flash. Remember this! 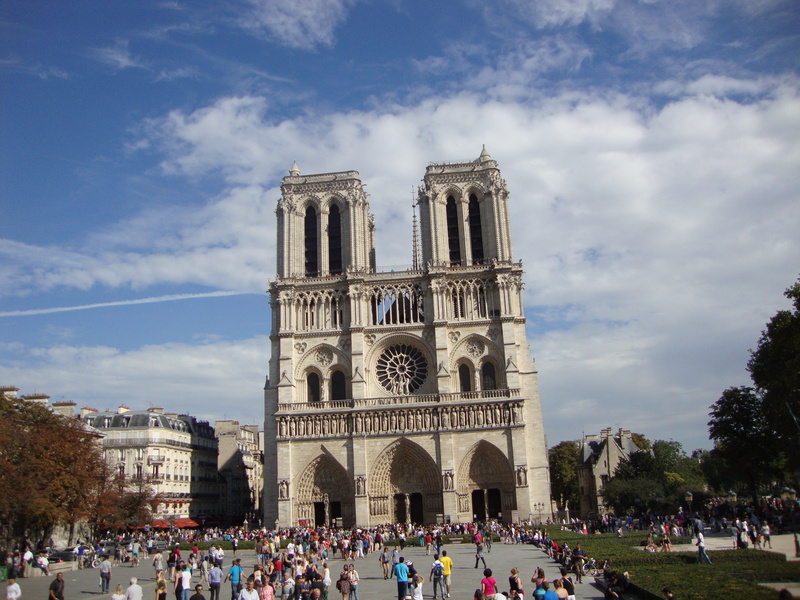 After the Louvre, our bus took us by Notre Dame Cathedral. 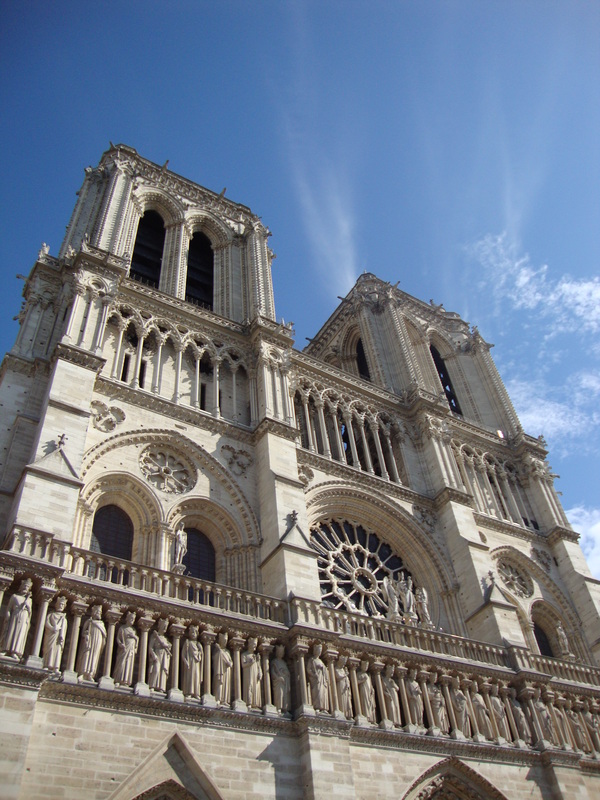 No Quasimodo in sight, unfortunately. 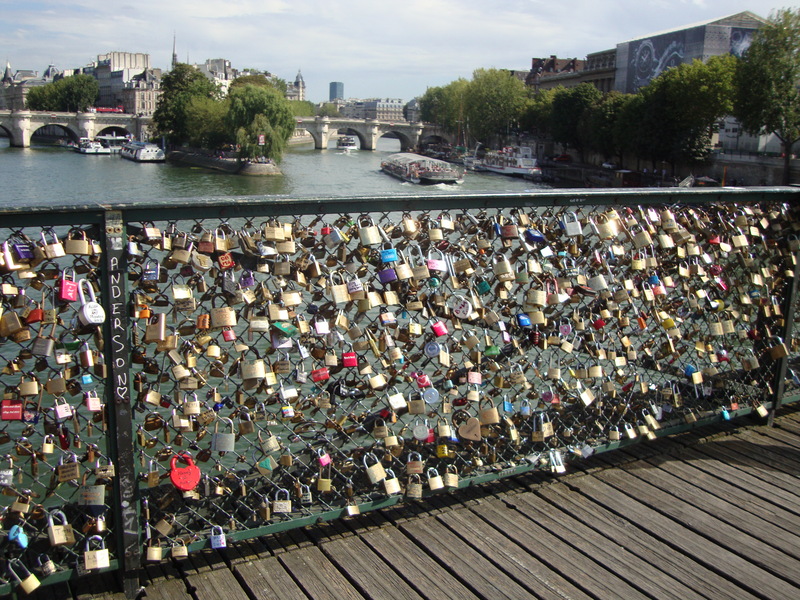 After Notre Dame, you can stop by the “Love Lock” bridge, where lovers take padlocks with their names and anniversary dates, and lock them onto the bridge. We didn’t find it to be as romantic as it’s made out to be. First, we didn’t see any locks being sold nearby. We didn’t bring one because we were confident that they would be sold in the streets by a savvy entrepreneur. I guess no one has thought of it, but I’d imagine someone could make a ton of money off of this! Our second issue was that the locks don’t stay there FOREVER, like most people think. The oldest lock we could find was from one month prior. Which tells us that the fencing is exchanged on a frequent basis. There are just too many tourists coming here and not enough space for all of those locks. We don’t want to burst anyone’s bubble, but just please don’t come here thinking you will have something romantic to come back to in 20 years. They are taken down almost as quickly as you put them up! It’s an interesting bridge to look at, though. 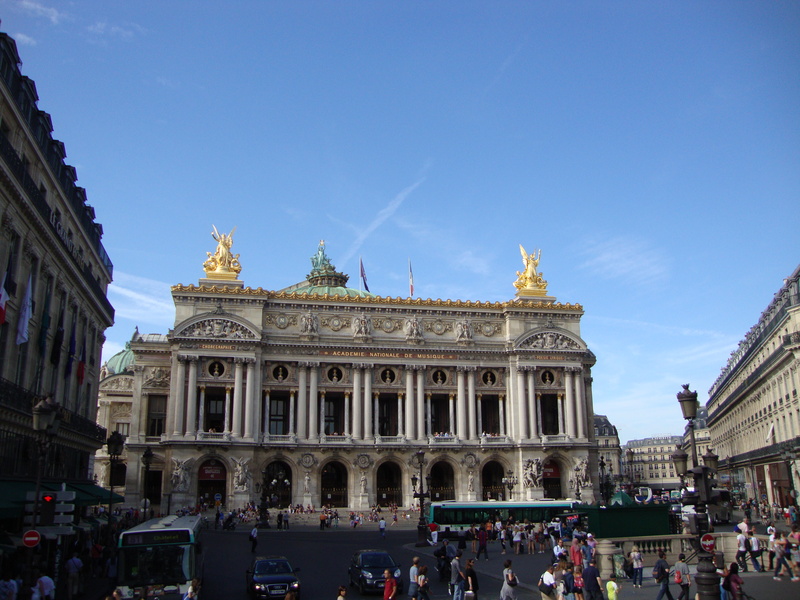 The last two stops on our bus tour included the Musée d’Orsay and the Opera House. We didn’t have the time to visit either, unfortunately, but loved the buildings. 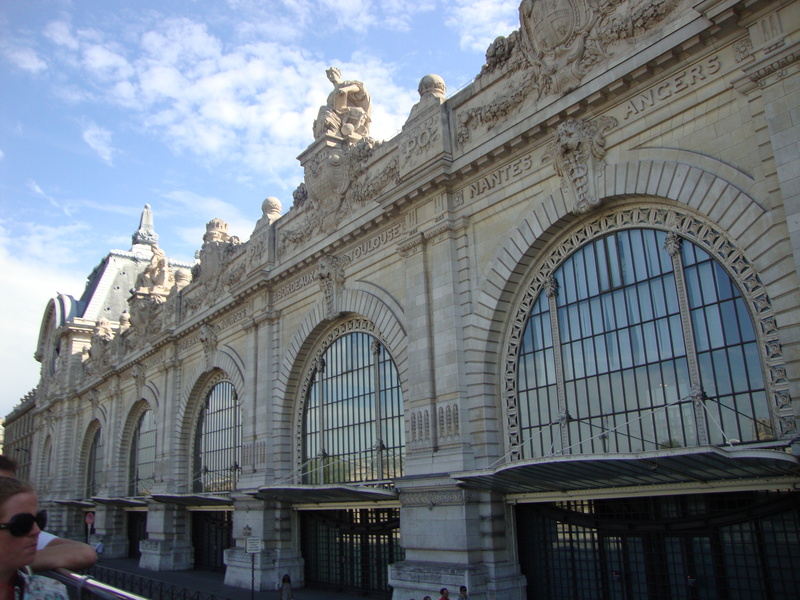 Paris has some of the most magnificent architecture. Overall, we had a great quick tour of the city. 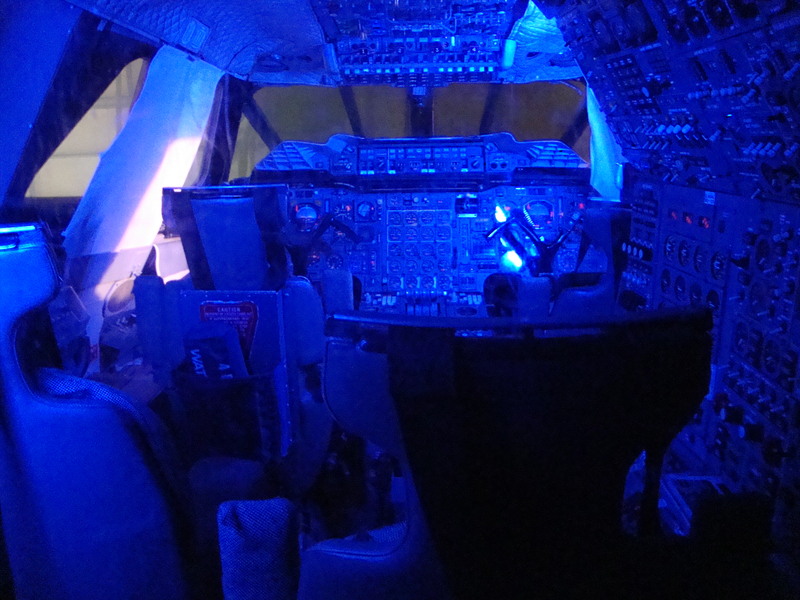 We’d also recommend taking the bus tour after dark if you have the time. The city is most beautiful at night, and the yellow lights against the navy blue sky seem straight out of a Van Gogh. 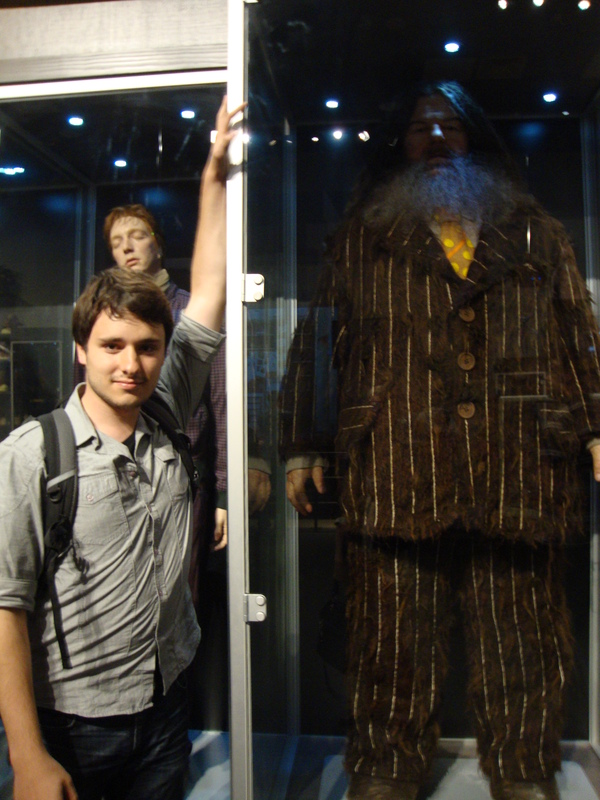 Admittedly, Alex and I are both big fans of Harry Potter. We’ve both read all the books and seen all the movies. 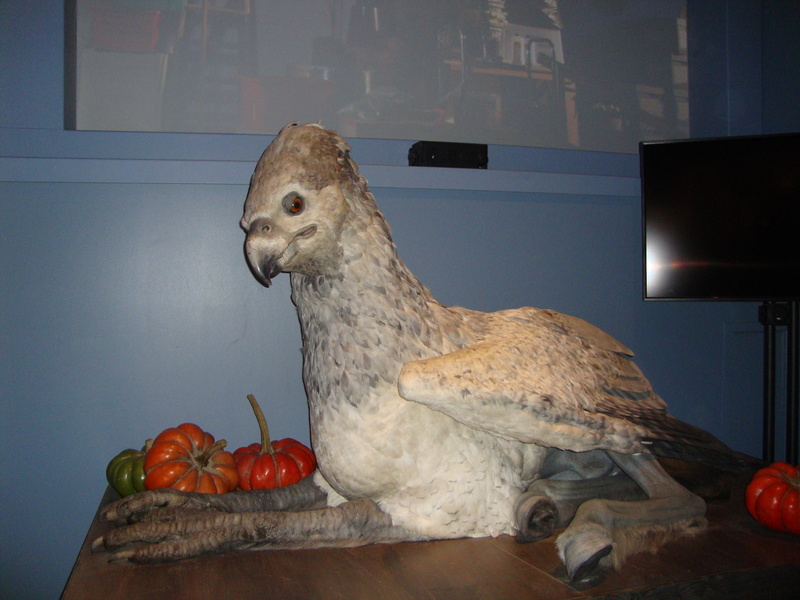 So we were excited to learn that mere muggles like ourselves could actually step into the world of Harry Potter at Warner Brothers in London. 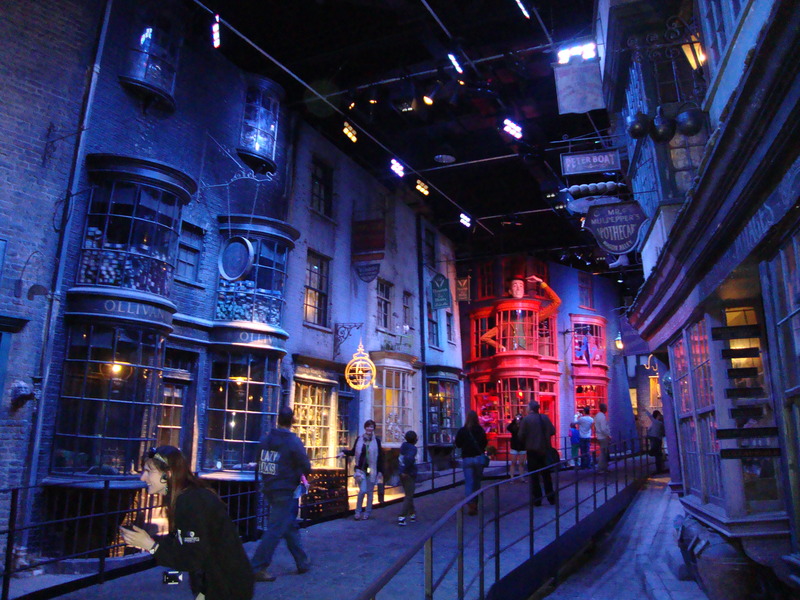 They offer a tour of the actual movie sets used during filming. 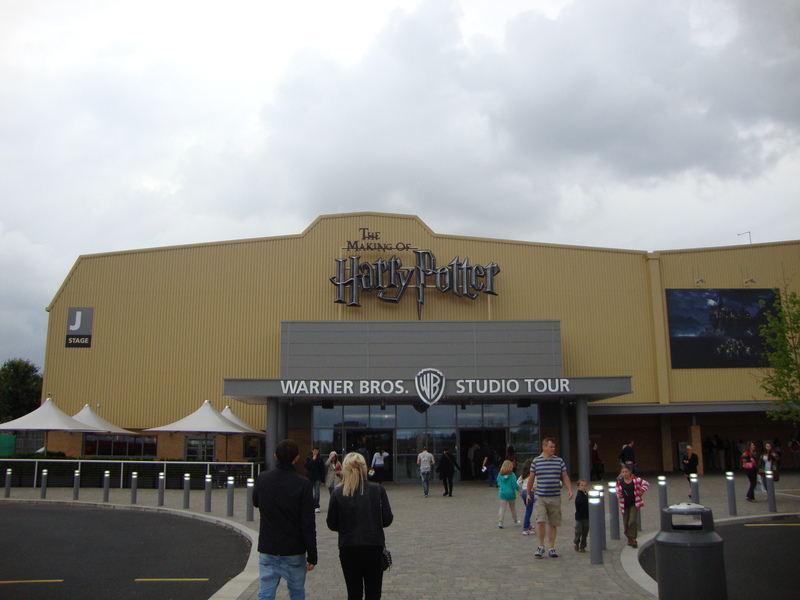 The studio itself is only about 30 minutes outside of London, so we added this to our itinerary. 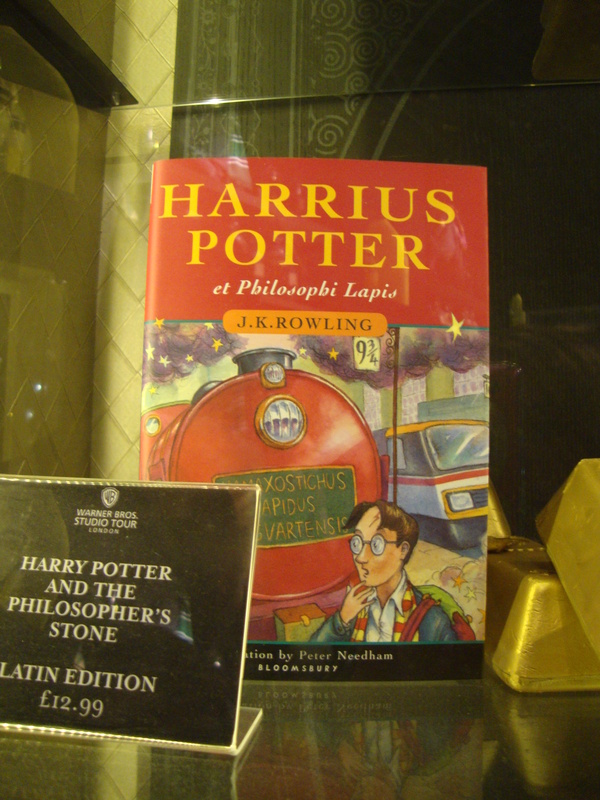 To get there, we took the train out to Watford Junction and hopped on board a Harry Potter themed double-decker bus en route to the studio. We got there at least an hour and a half before our scheduled tour time. They recommend that you get there 20 minutes beforehand, but we overestimated the time it would take to get there using public transportation. Luckily, there’s plenty to do and see until your tour begins. 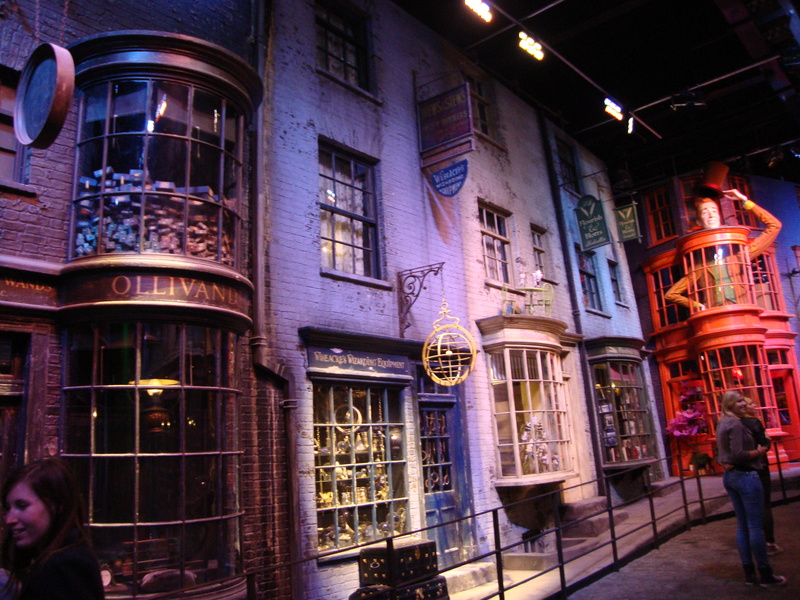 Inside, there is a cafeteria and a very large retail store where you can buy nearly any type of Harry Potter merchandise you could imagine. The tour starts with a very long line that leads to an auditorium. It never seems to die down because only a few people are let in at a time. It took about 30 minutes before we reached the end of the line and were led into the auditorium for a short introduction video. After that, we were free to move onto the set. 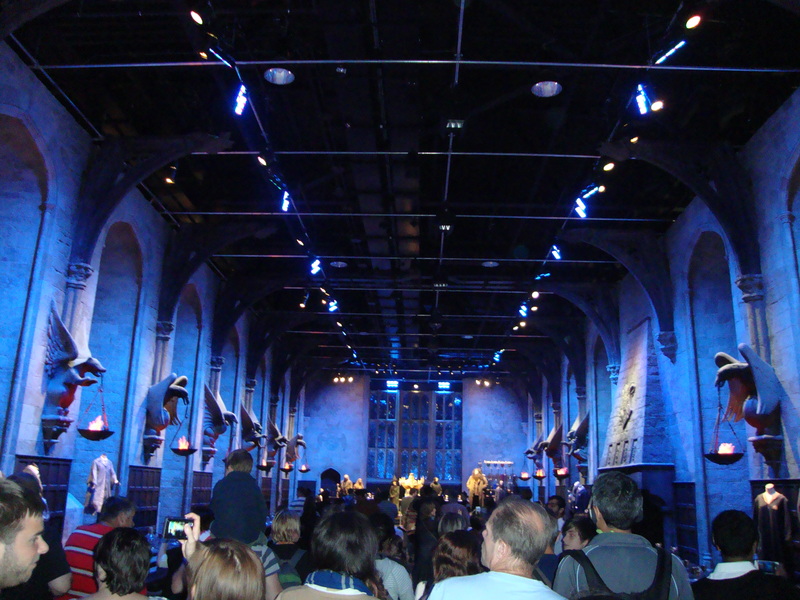 We don’t want to ruin any surprises, but will say that the way you get onto the first set (the Great Hall) is wonderfully unexpected. 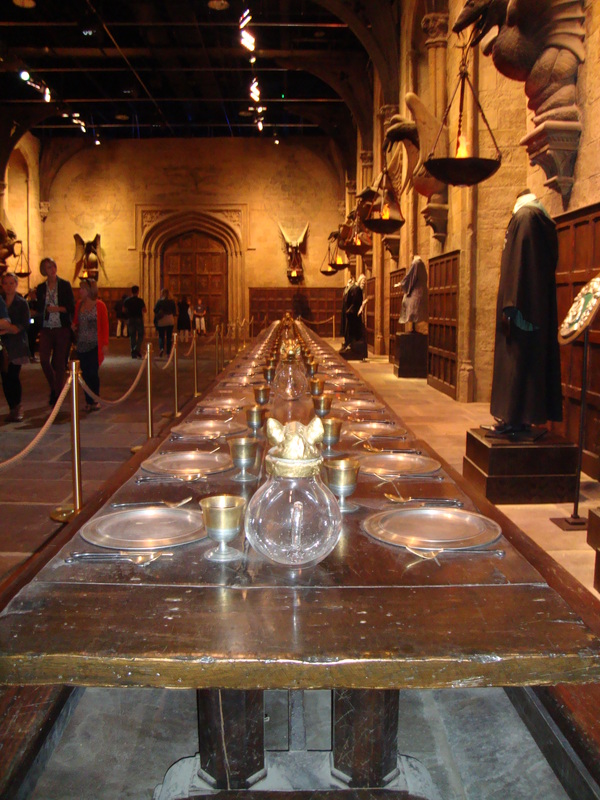 The Great Hall itself is exactly as pictured, with the house tables pushed to each side of the room. 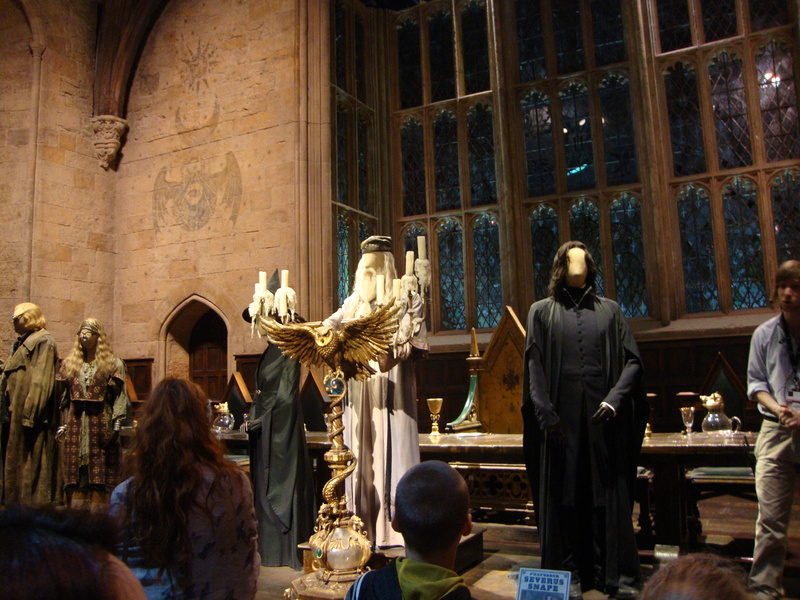 The front of the room is set up with mannequins of the professors and their costumes, just as they appear in the movies. 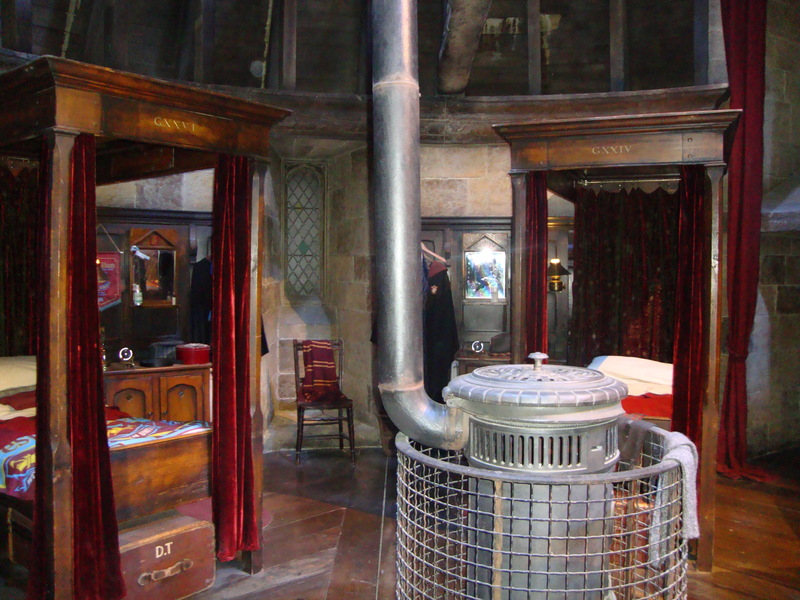 After leaving the Great Hall, there are a plethora of “mini-sets” including the boys’ dorm, the Gryffindor common room, and the Weasley’s kitchen. 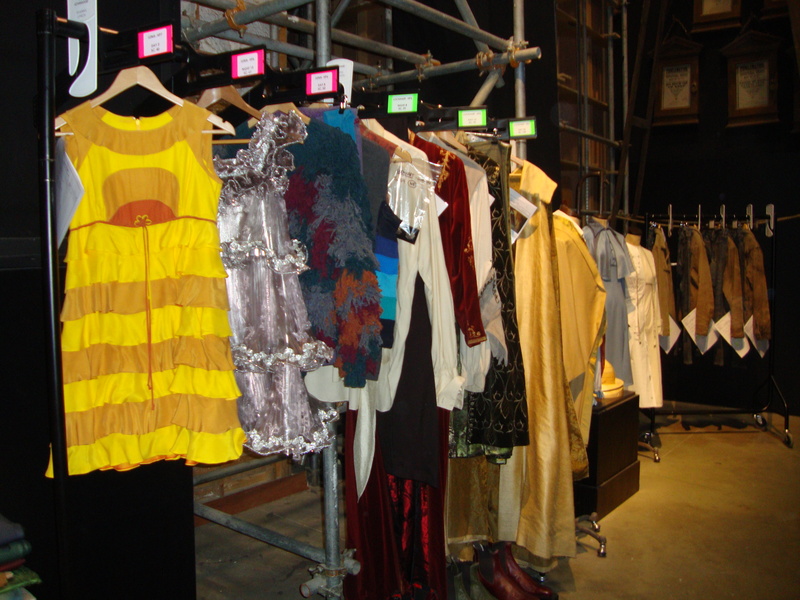 There are also various movie props and costumes scattered throughout. 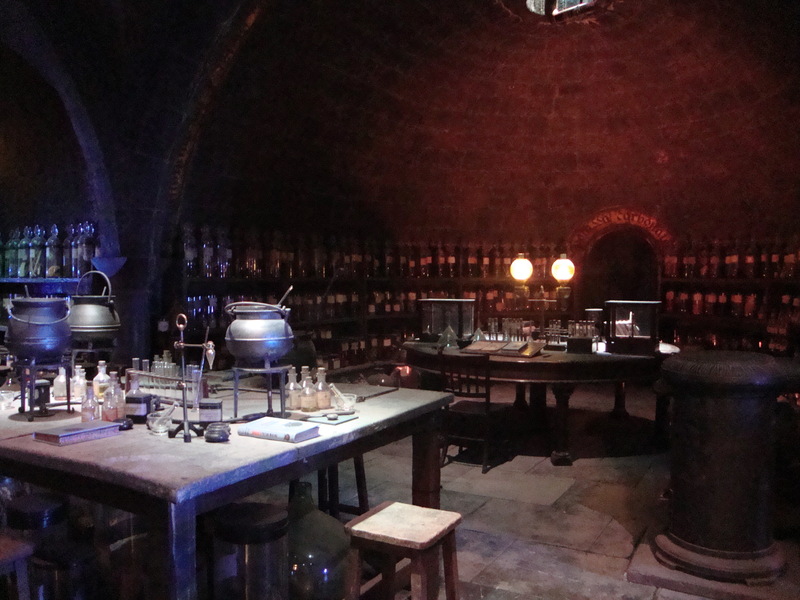 Some of the other small sets included Dumbledore’s office, Hagrid’s hut, and the Potions classroom. 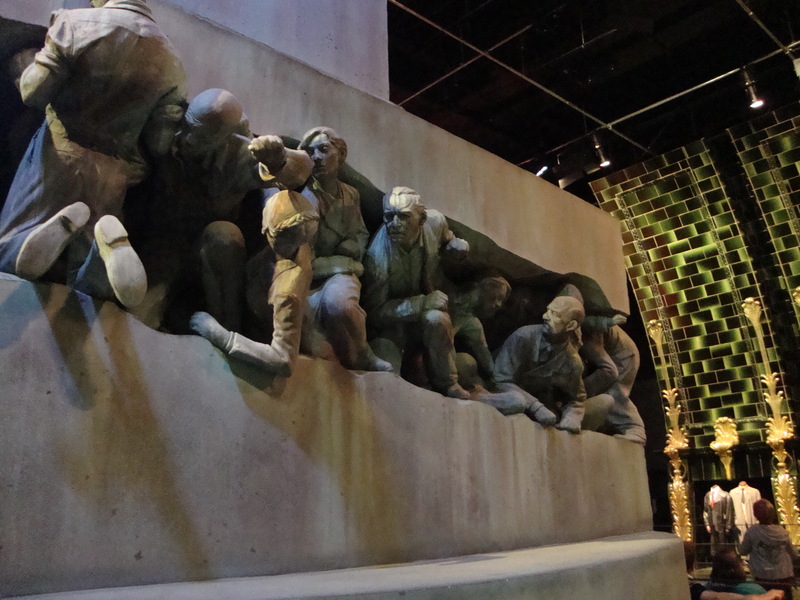 I personally liked the visiting the Ministry of Magic. 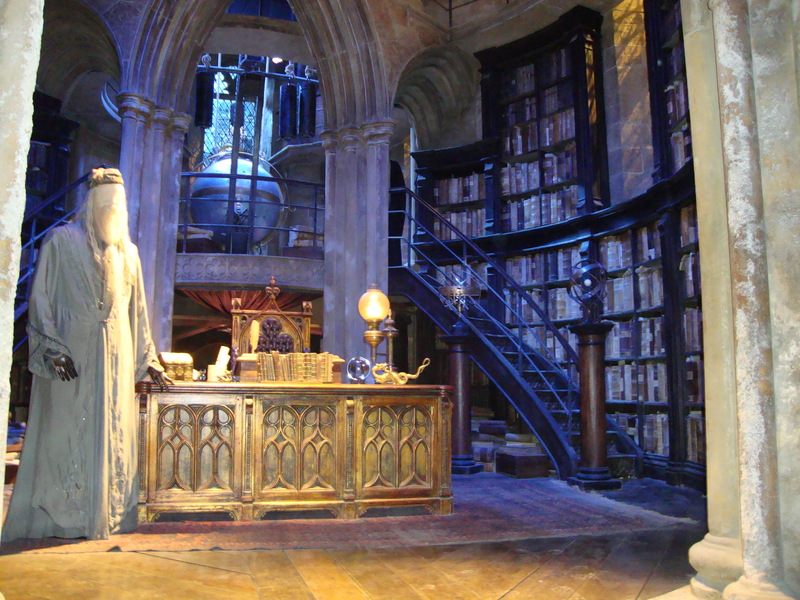 It was pretty large and therefore felt more “real” than some of the other interior sets. 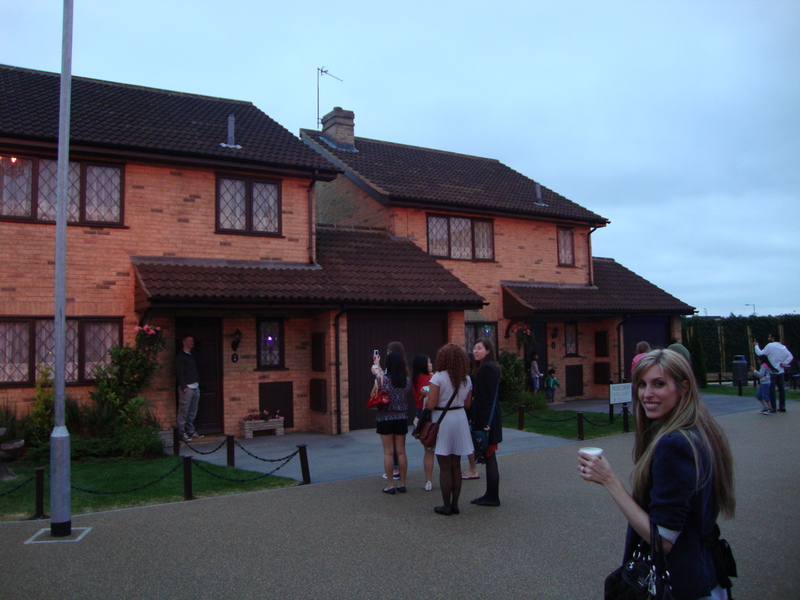 Outside, we got to visit the Dursley’s home on Privet Drive. We also got to quench our thirst with a cold cup of butterbeer! It tastes like it’s cream soda with some butterscotch and is nonalcoholic. The next building of the tour focused on behind the scenes production and technology. 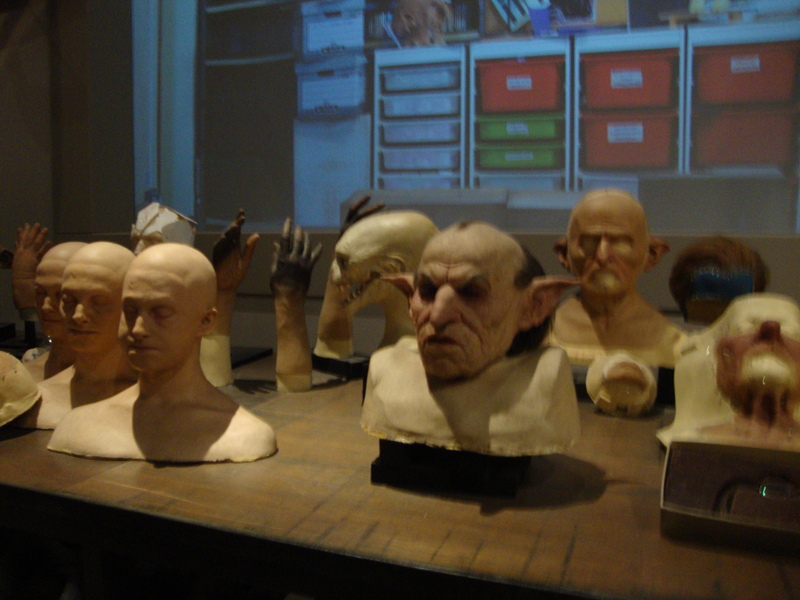 We learned about the elaborate makeup and various animatronics that were used in these films. It was a pretty interactive part of the tour, and we even got the chance to test out some of the special effects ourselves. 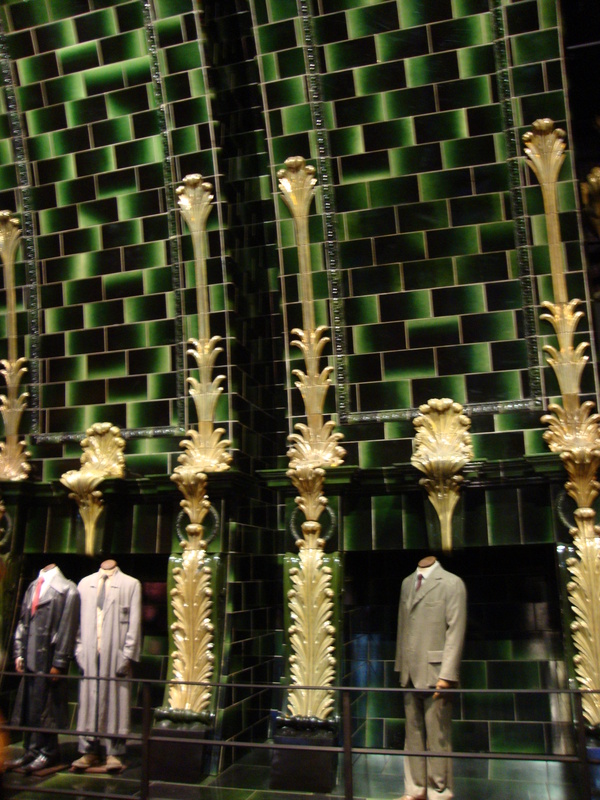 Finally, we walked through Diagon Alley and made our way to Hogwarts Castle. 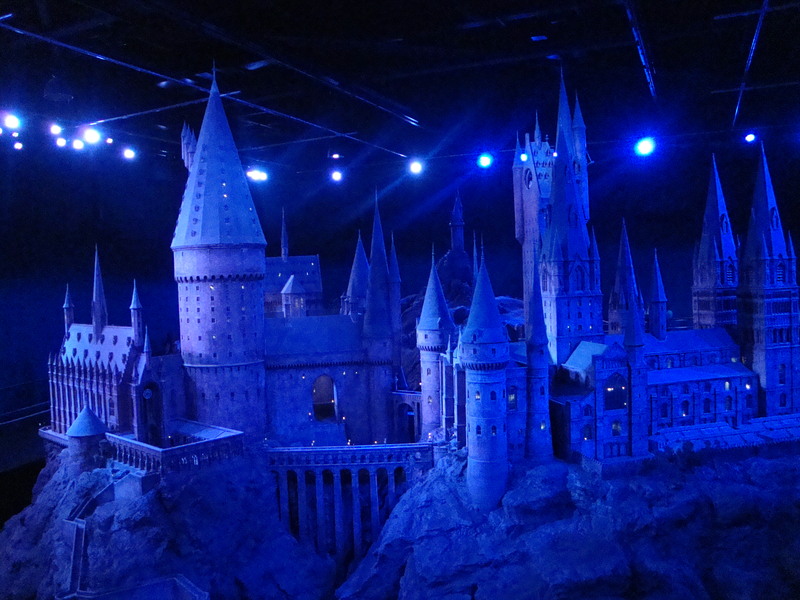 The model of Hogwarts itself is not lifesize by any means, but it was used for the exterior shots of the castle during filming. We really enjoyed our time here. Any movie fan will appreciate the detail that goes into these sets. 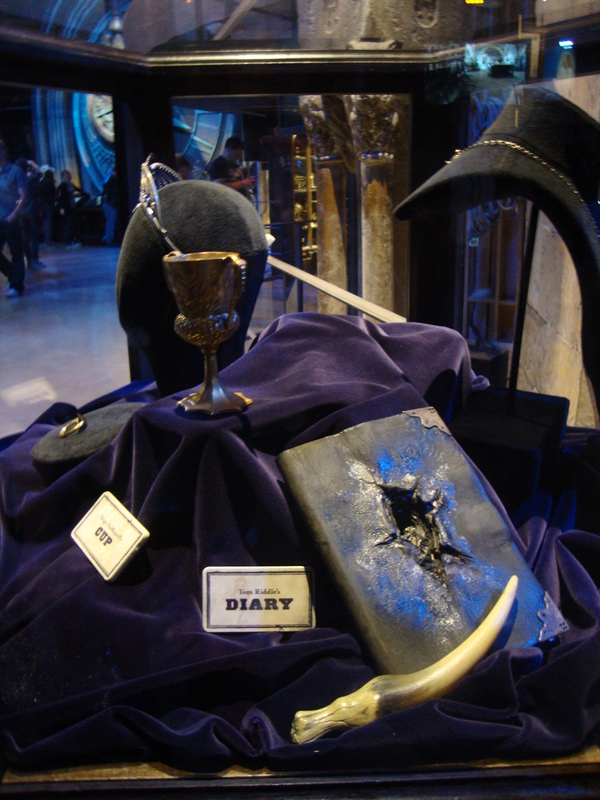 We also walked away with a lot of new information and insight about the movies. It was very educational yet extremely interesting at the same time. Watching the movies will certainly never be the same! 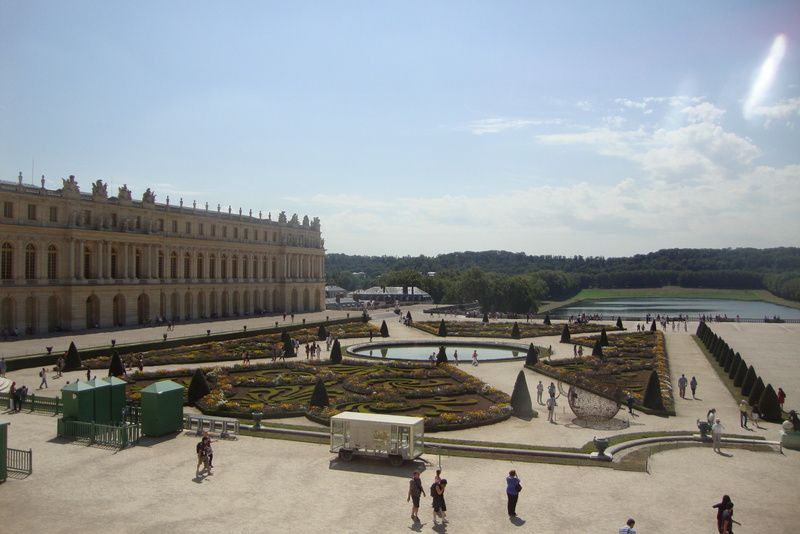 Coming from the U.S., palaces and castles seem like something out of a storybook. We just don’t have them here. Part of Europe’s appeal for American tourists is being able to see and experience these magical places. That’s why Alex and I decided to visit several when we planned our anniversary trip to England. 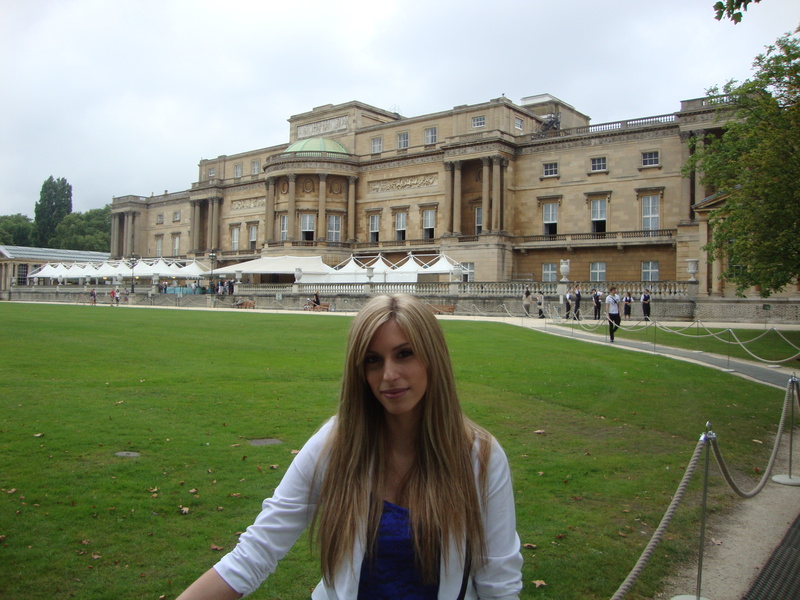 During our time there, we went to Buckingham Palace, Windsor Castle and Hampton Court Palace. 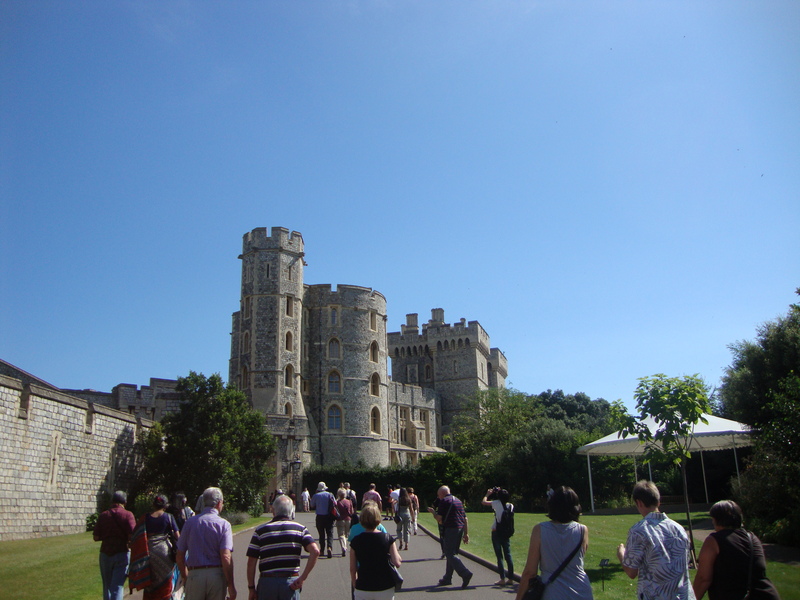 While Buckingham Palace is located in downtown London, Windsor Castle and Hampton Court Palace are both situated within an hour’s drive of the city. 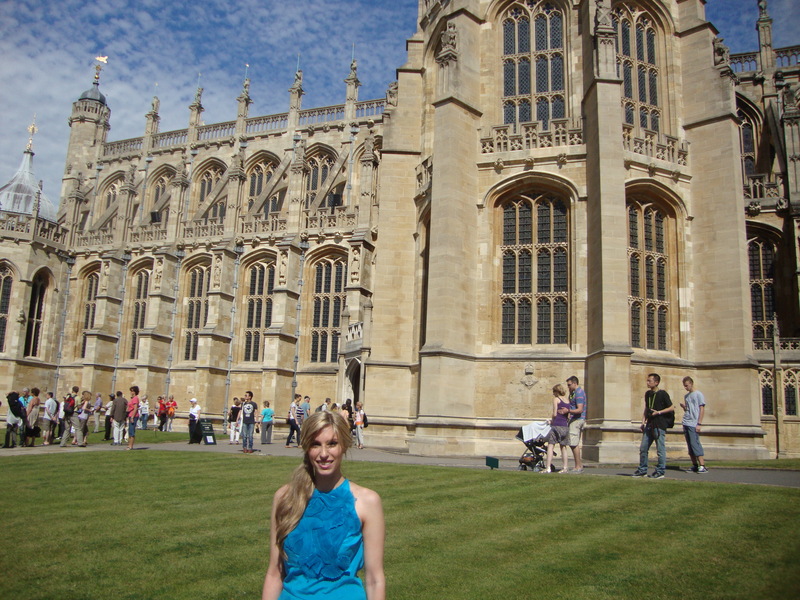 Windsor Castle is one of the Queen’s official residences, about 25 miles outside of London. It’s in a beautiful part of the countryside and is therefore not accessible from the tube or train. Driving up to the Castle is interesting though, as it’s surrounded by a cozy little town. 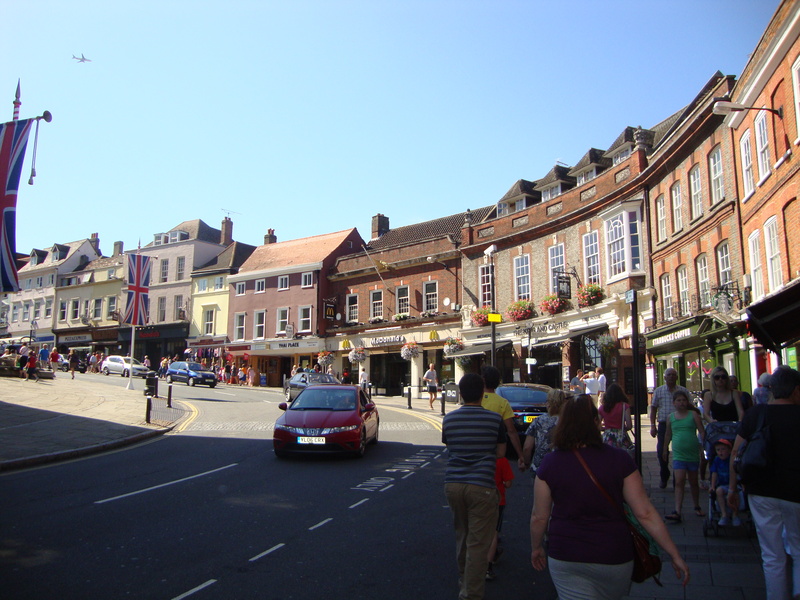 Public parking can be found nearby and is only about a 5 minute walk from the Castle. The castle exterior is absolutely stunning. It’s one of very few castles of its age that remain in such excellent condition, thanks to the Monarchy’s ongoing presence. 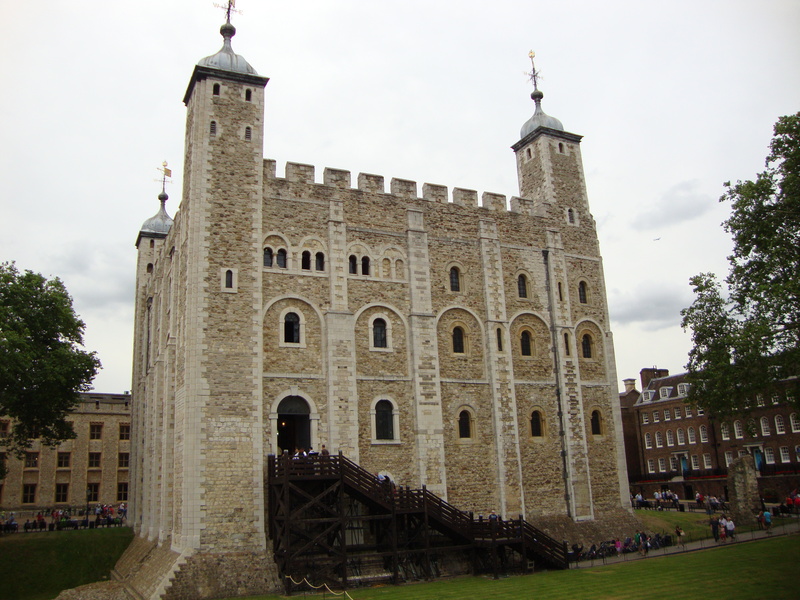 The style of architecture is very reminiscent of the Tower of London and in fact dates back to the same origins. 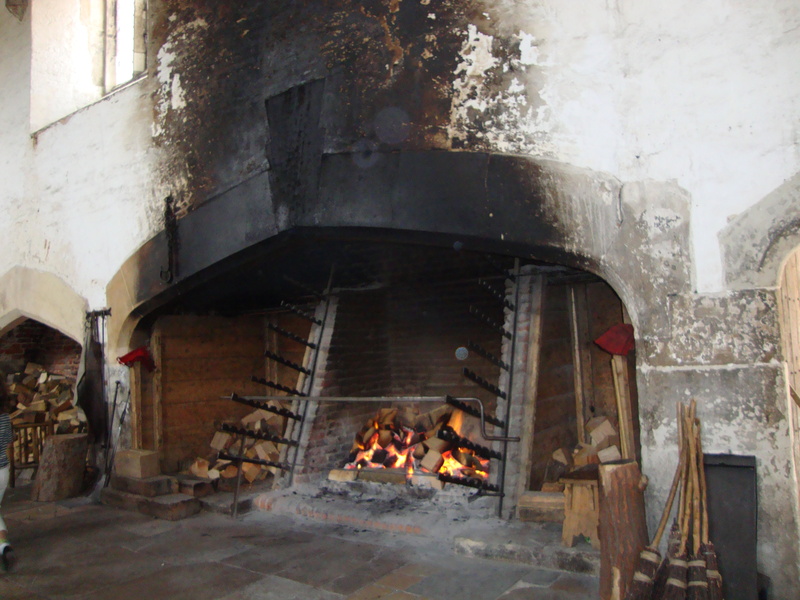 Contrary to the exterior, the interior rooms of the castle were both modern and ornate. 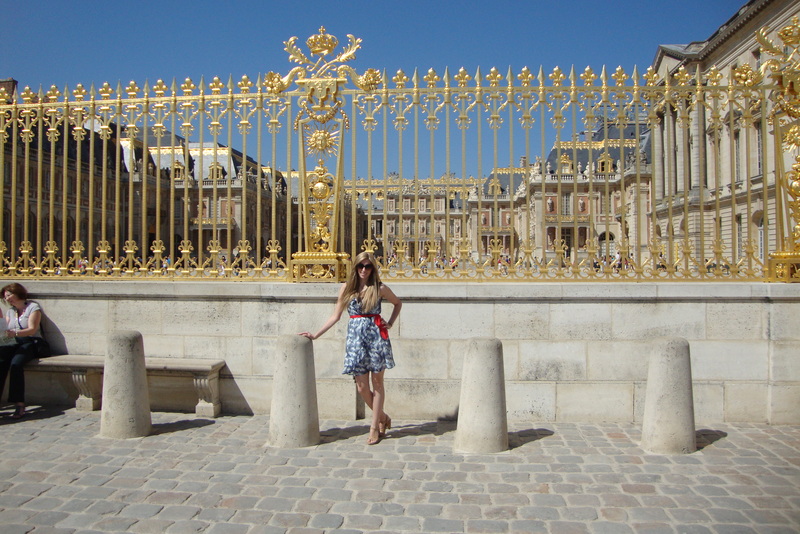 During our visit, we got to see the Changing of the Guards. We missed the beginning when the Guards walk through the street, but caught the last 10 minutes inside the Castle walls. Typically, the entire ceremony takes about 30 minutes. The castle is also home to St. George’s Chapel. It is actually much larger than I expected it to be. 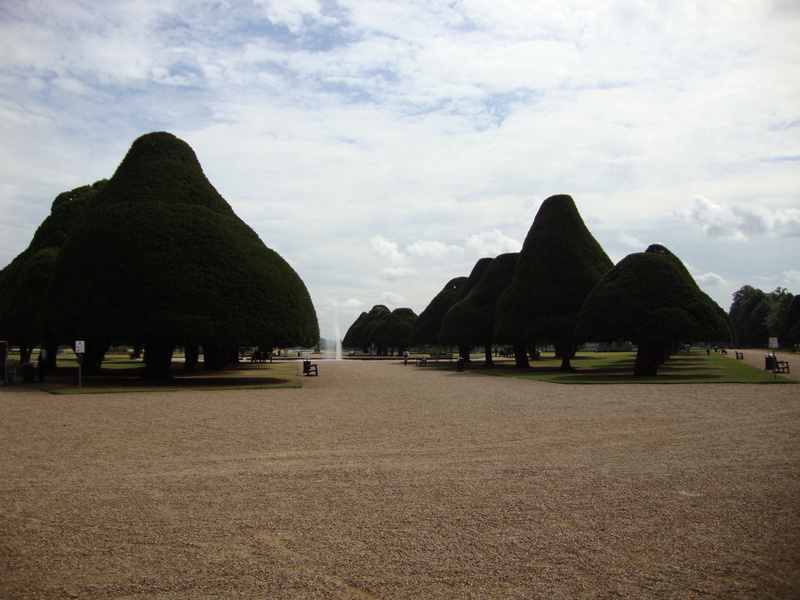 This is where King Henry VIII and his favorite wife, Jane Seymour, are buried. 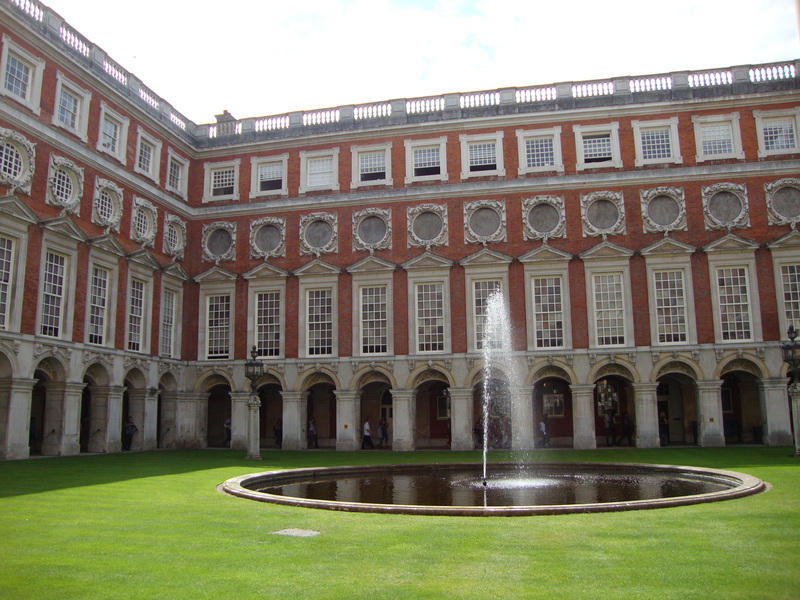 Speaking of Henry VIII, the other palace we visited outside of London was Hampton Court Palace. 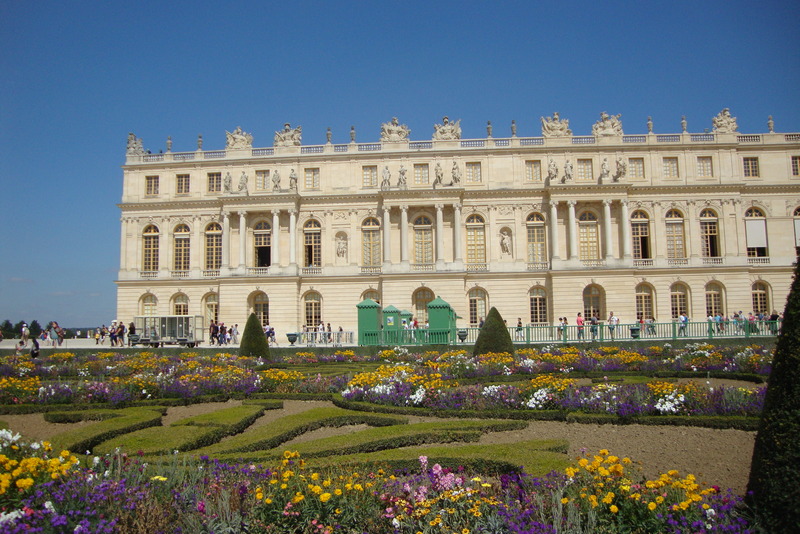 It’s one of his former residences and is not currently occupied by the Monarchy. 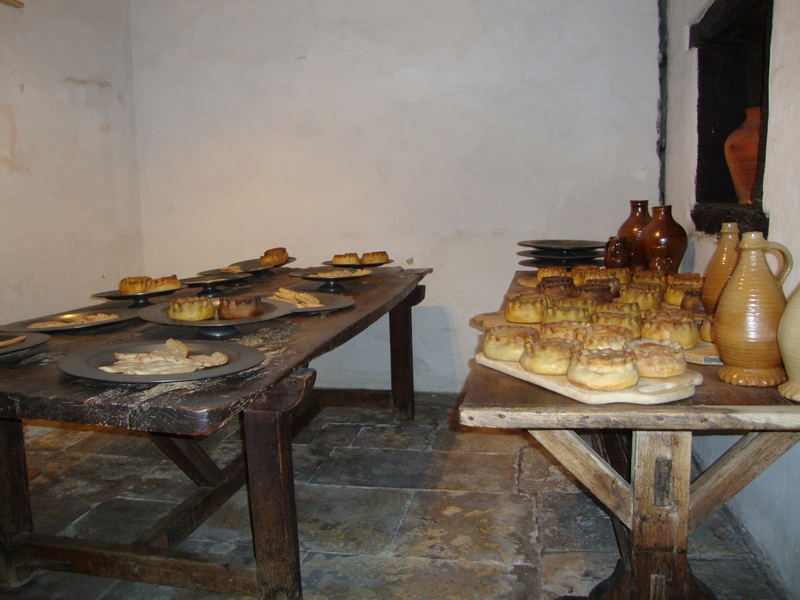 Inside the Palace is the Great Hall, where Henry indulged in feasting. 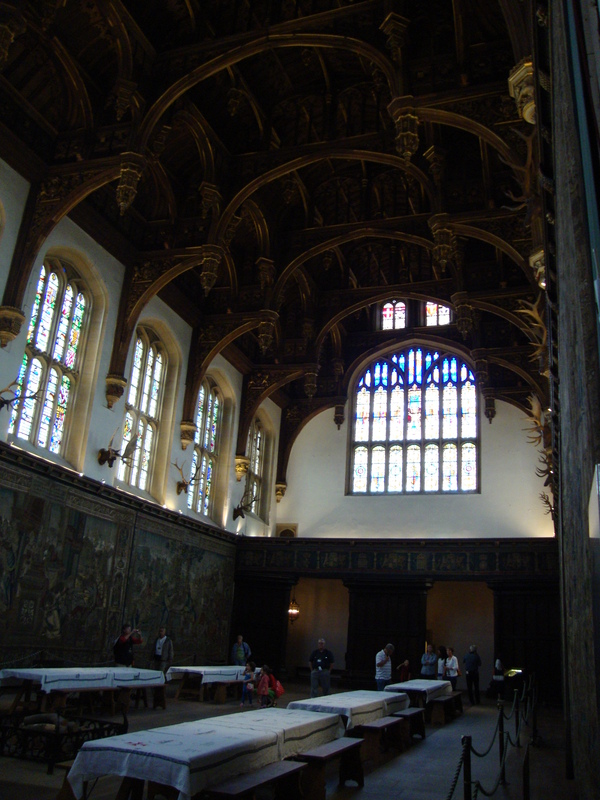 We were joined in here by Henry VIII once again, along with Anne Boleyn’s brother George. We followed both of them into the Great Watching Chamber, which is the entrance to Henry’s State apartments. 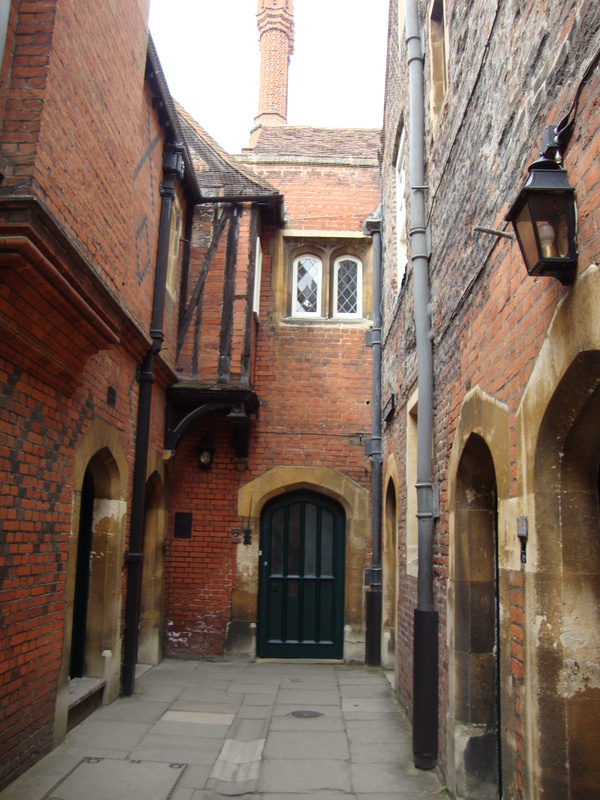 They were met by Anne Boleyn, where a furious argument ensued between her and the King. At this point, they took leave of the sizable audience that had formed around them. 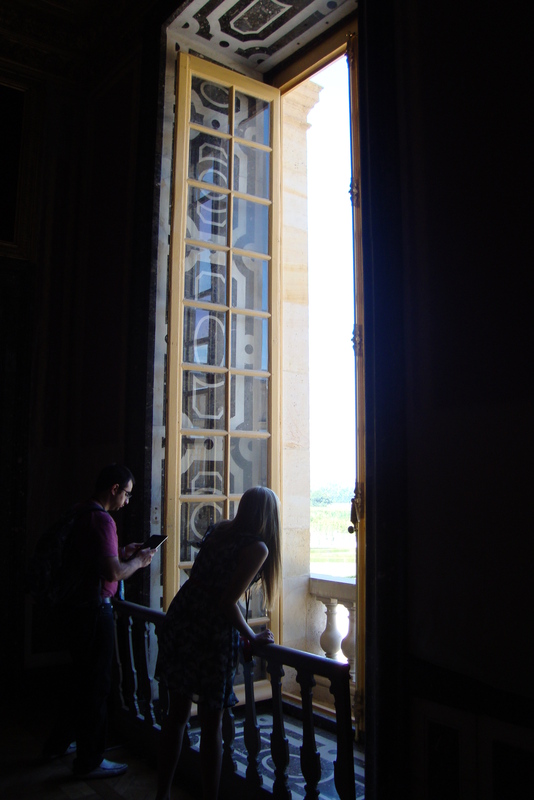 With the help of our audio guides, we made our way through the rest of the palace independently. 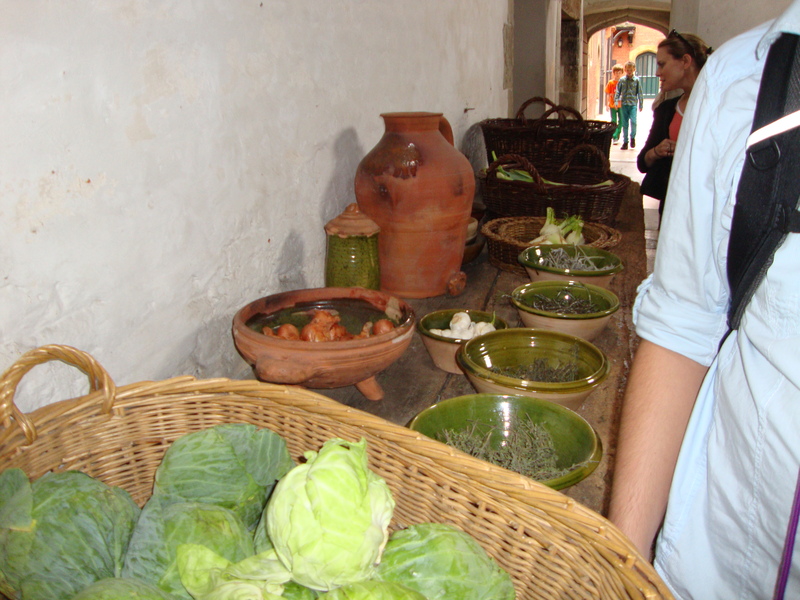 All sorts of food were being prepared, including soup, pies, and meat…all of the plastic variety. It still looked good enough to eat! In addition to the Tudor experience at Hampton Court, there are several extensions from the 18th century and a vast, magnificent garden. 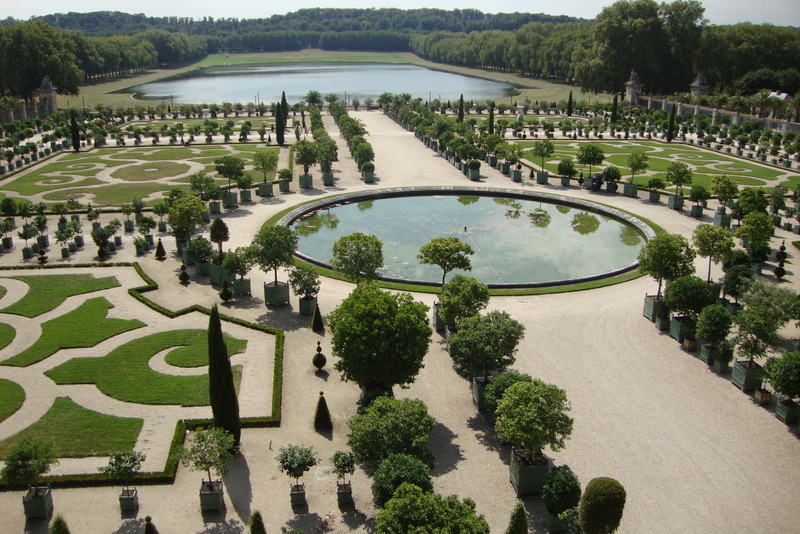 You could stroll around the gardens for hours if you wanted. You can even attempt to make your way through a hedge maze, for a small fee. The maze itself is fairly small, but still fun. 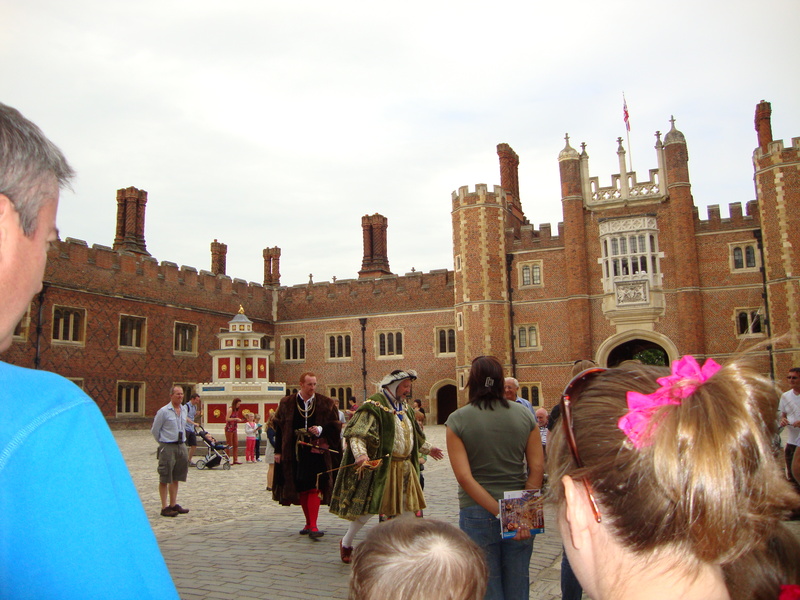 We didn’t go through it this time, but have on previous visits to Hampton Court. 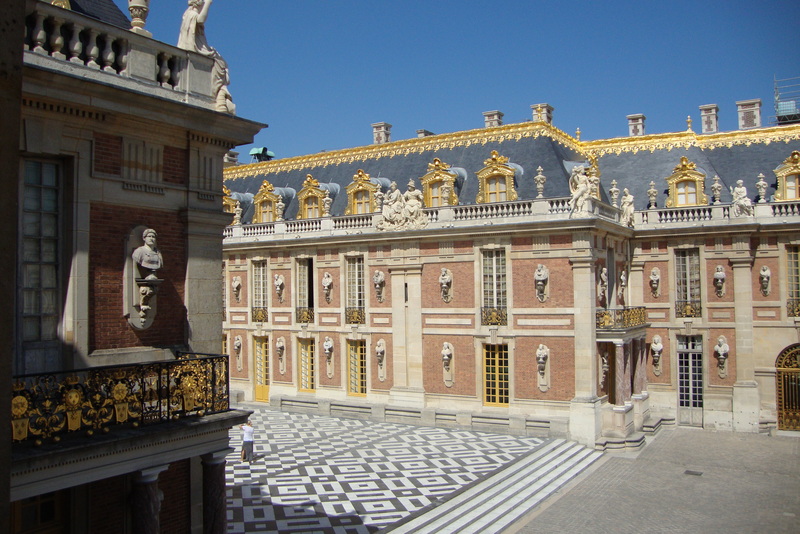 This Palace is one of our favorites, especially because of its accessibility from London. 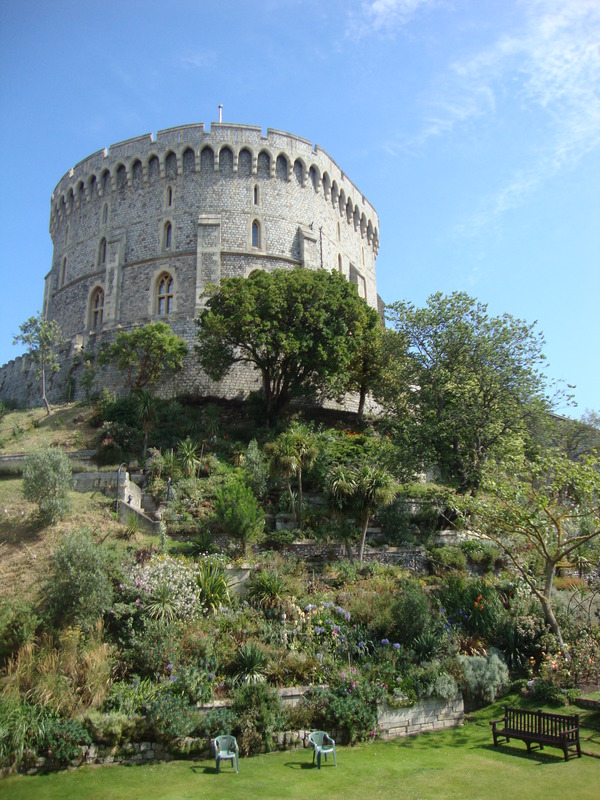 Unlike Windsor Castle, it is accessible by train. 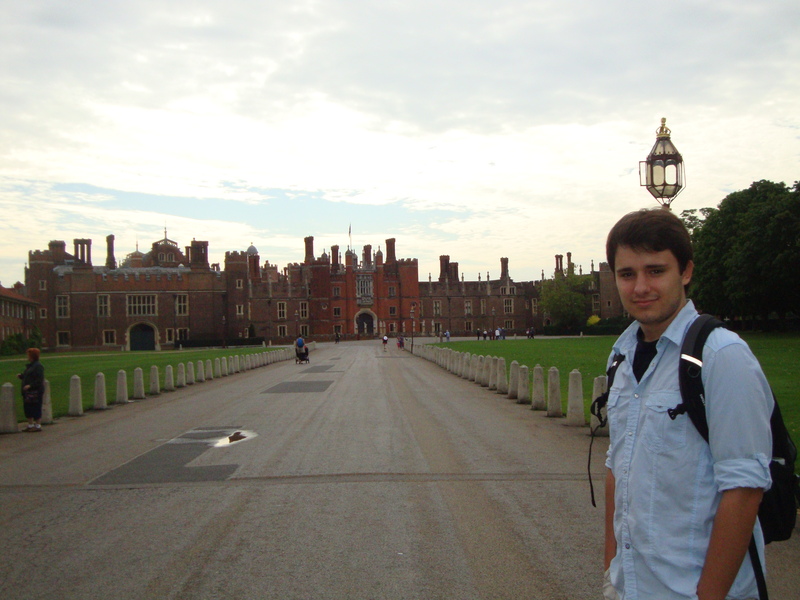 You can take the tube to London Waterloo, and then hop a train to Hampton Court from there. 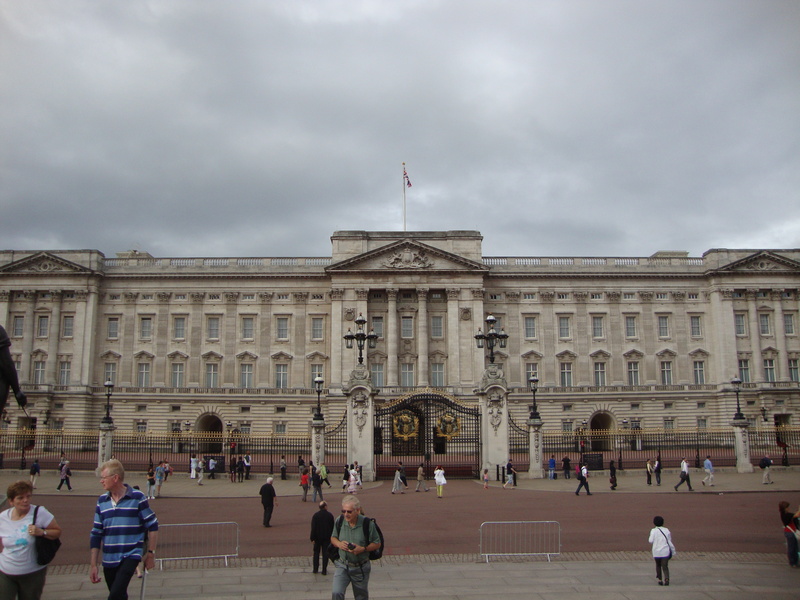 Buckingham Palace became the official London residence of the Monarchy with Queen Victoria in 1837. Currently, Queen Elizabeth II lives here. Buckingham Palace is pretty accessible to the public- visitors are able to walk right up to the front gate and watch the Guards. If you have the chance, try to catch the Changing of the Guards ceremony…it is a very impressive sight to see! 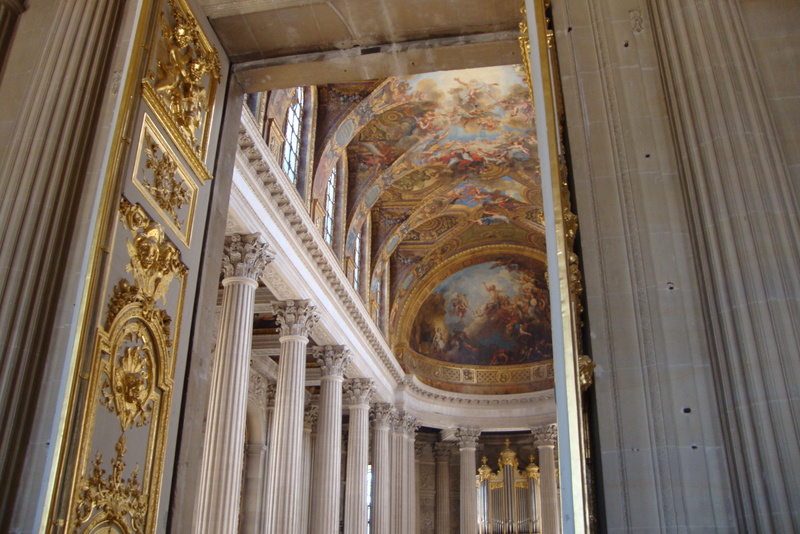 During the months of August and September, you can take a tour of the State Rooms inside the palace. 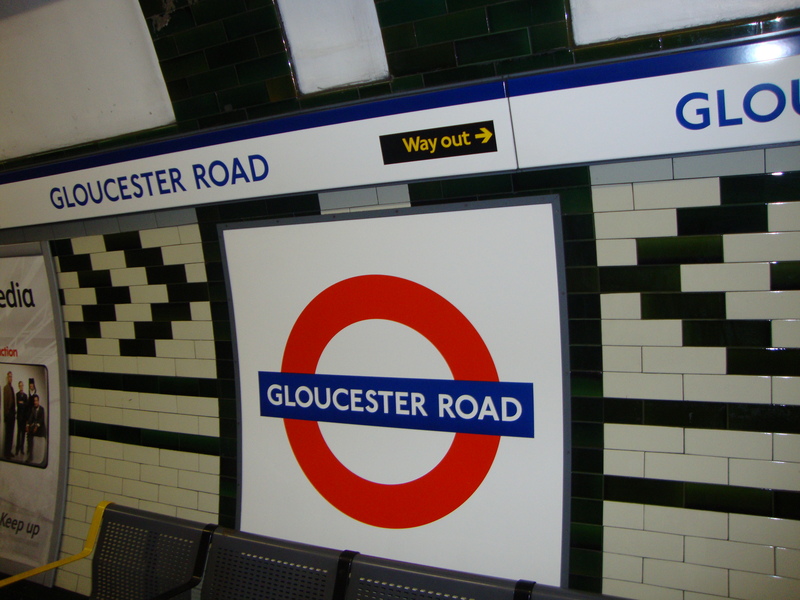 The two closest tube stops are St. James’s Park (Circle and District lines) and Victoria Station (Circle, District and Victoria lines). 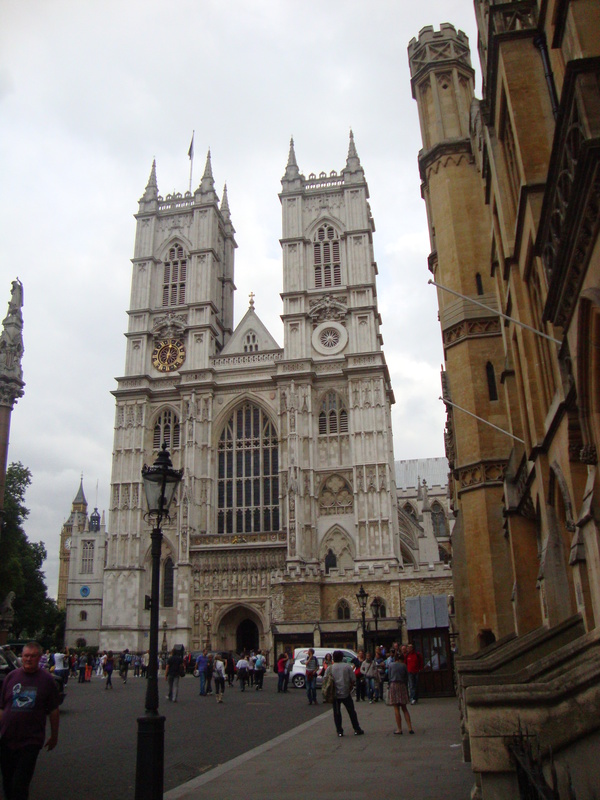 A brief walk from Buckingham Palace is Westminster Abbey. The Abbey’s royal history is second to none. It’s where all coronations are held and has hosted many royal weddings, including Prince William and Dutchess Catherine’s in 2011. Princess Diana’s funeral was also held here, and it is the burial place of many British monarchs and historical figures, including: Elizabeth I, Henry VII, Mary I, Mary Queen of Scots, Geoffrey Chaucer, Oliver Cromwell, Sir Isaac Newton, Charles Dickens, Charles Darwin, Rudyard Kipling, and Sir Lawrence Olivier. Entrance fee is 18 GBP per person, and comes with an audio guide. If you are not coming from Buckingham Palace, the nearest tube stops are Westminster (District, Circle, and Jubilee lines) and St. James’s Park (Circle and District lines). Often mistaken for “London Bridge”, Tower Bridge competes with Big Ben for the title of most iconic London landmark. It sits across the Thames river, directly next to the Tower of London, hence the name. You can go up inside the bridge as part of an exhibition, which includes a tour of the engine rooms for 8 GBP per person. There are also magnificent views from the walkway at the top. 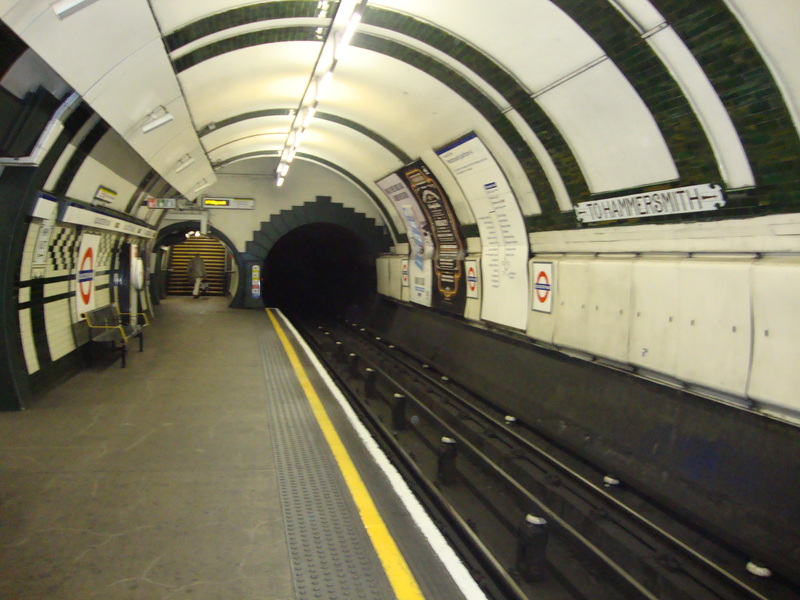 The nearest tube station is Tower Hill (District and Circle Lines). 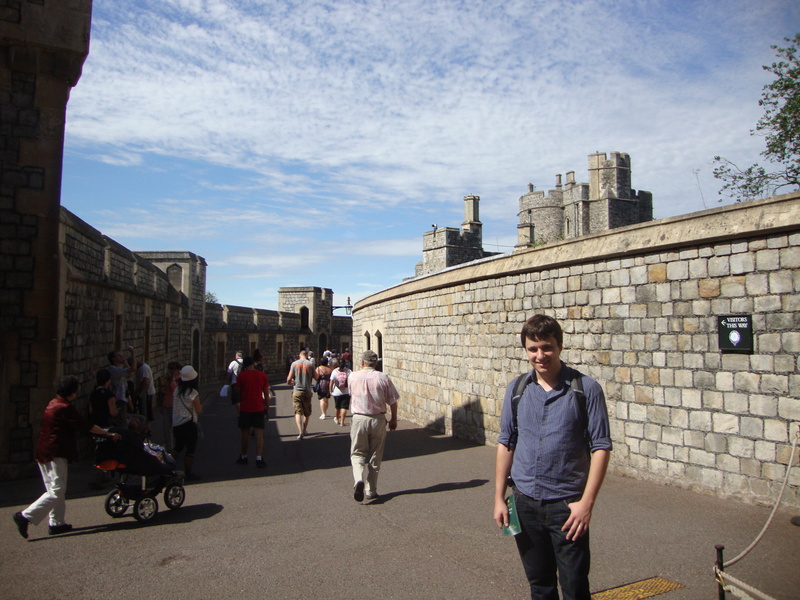 Any history buff will feel like a kid in a candy store at the Tower of London. Over the last thousand years, the Tower of London has served as a palace, a prison, a royal armory, a zoo, and a treasury. 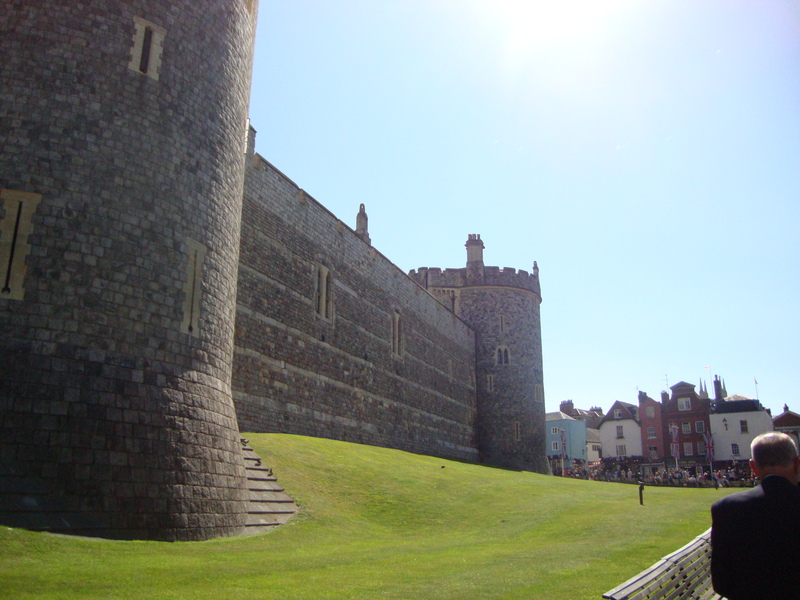 The picture above is of the White Tower, which is the original and central building. 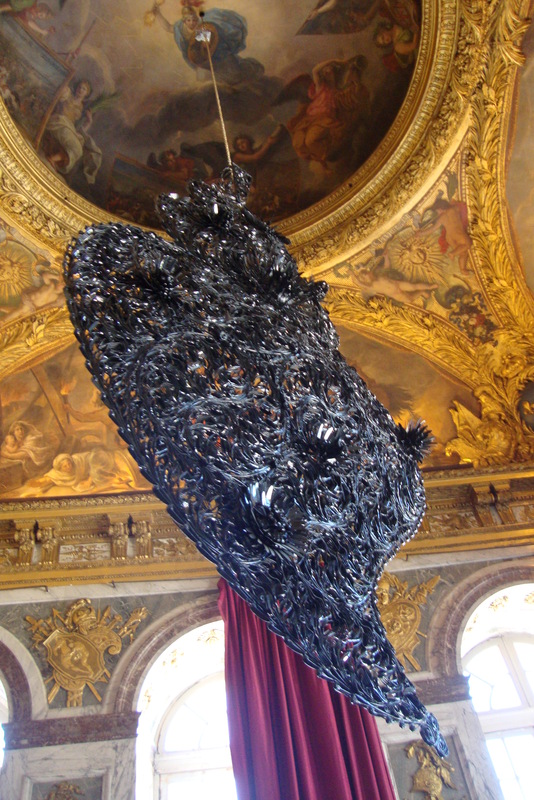 Currently, it houses a vast collection of armor and weaponry used by various Monarchs. 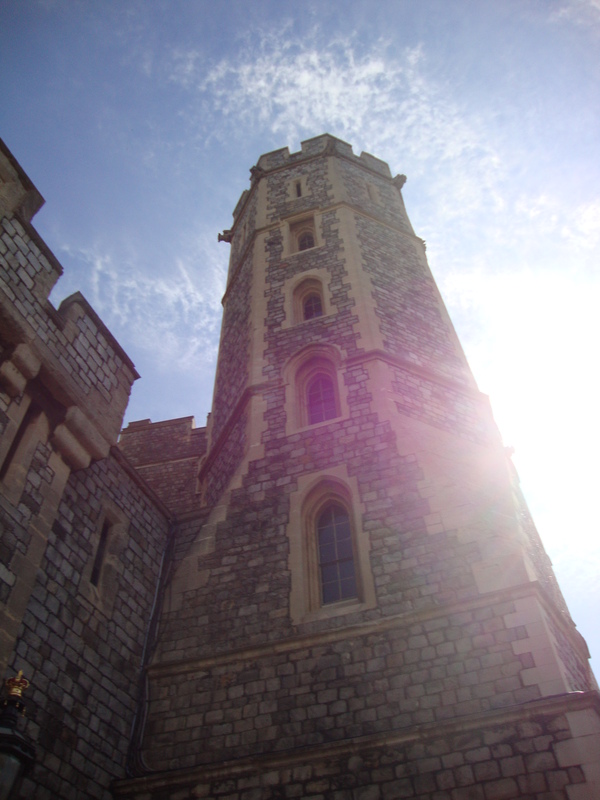 Behind the White Tower, the Crown Jewels are housed in the Waterloo Barracks. 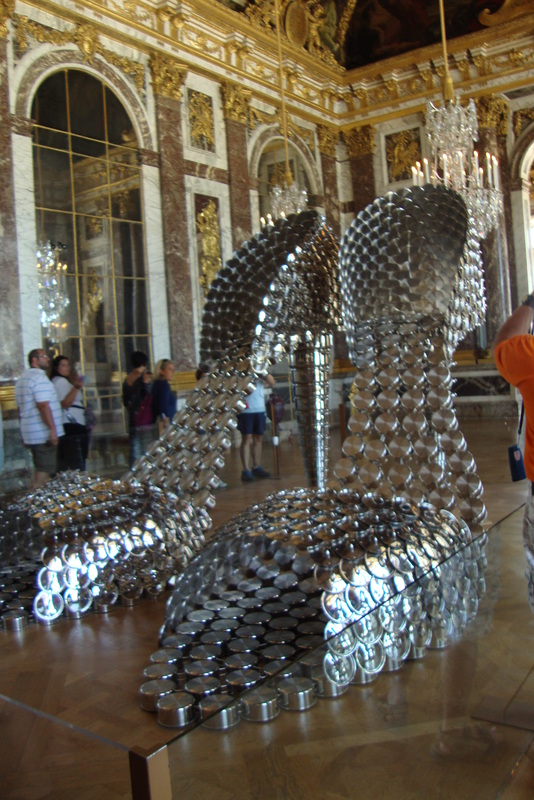 Moving walkways take you through several rooms of crowns, tiaras, and jewelry worn by Royalty. It’s truly an awe-inspiring collection, although expect to be pushed around in here by overeager individuals! Children who visit the Tower of London will enjoy seeing the ravens that wander around the grounds. Their wings are clipped, and tradition holds that if any escape, that the Tower and the Monarchy will fall. They bear a lot of responsibility! 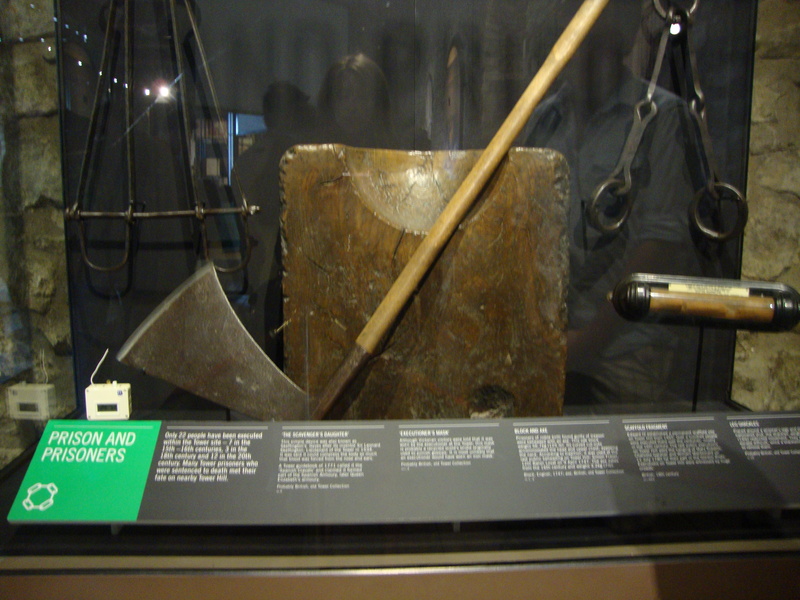 The Tower of London is perhaps most infamous for it’s gruesome history. 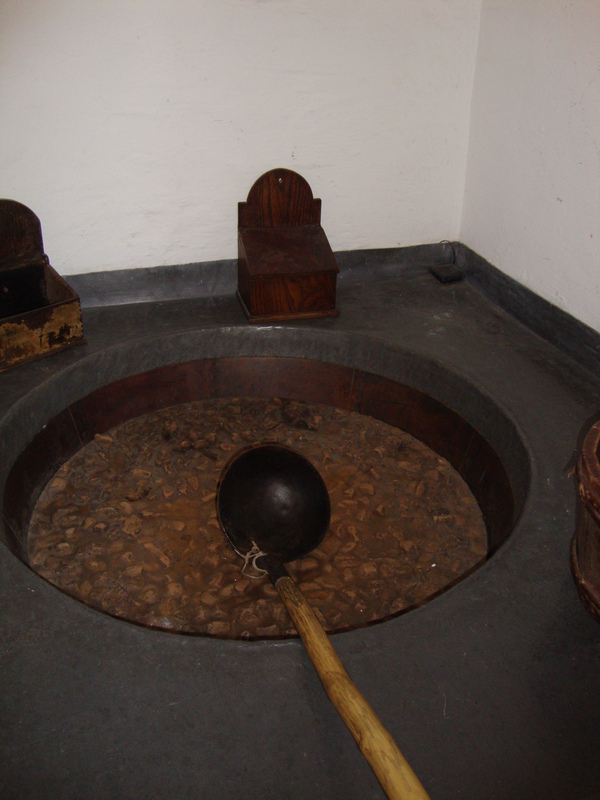 It’s the place where many “traitors” of the monarchy have been held prisoner and executed. Some of its most famous victims include two of Henry VIII’s wives, Anne Boleyn and Catherine Howard. It’s also the location where two of Britain’s young princes mysteriously “disappeared” in the 15th century. They have never been found, but rumor has it that their uncle was somehow involved before becoming King. 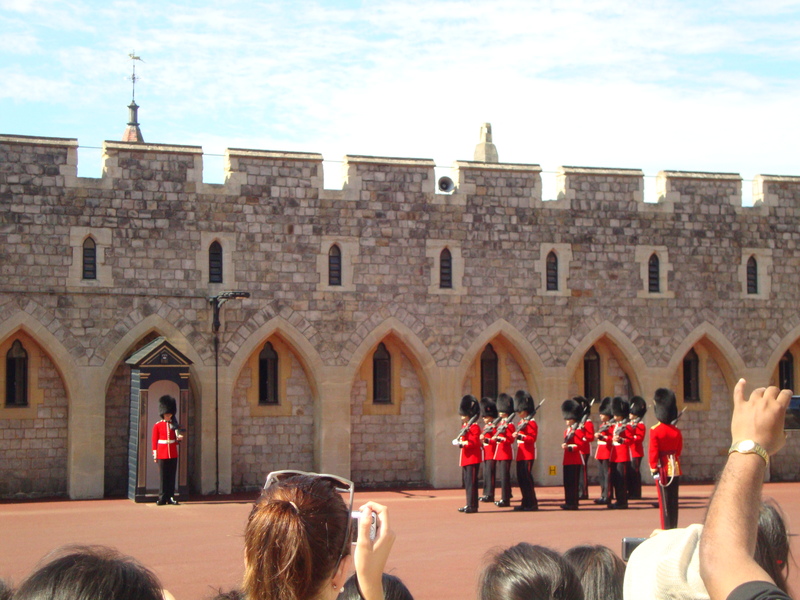 The Tower of London is guarded by Yeoman Warders, also known as “Beefeaters”. At night, visitors can attend the traditional Ceremony of the Keys, when the Chief Yeoman Warder locks up the Tower. It is free, but you must apply in writing, several months in advance. The entrance fee to visit the Tower of London is around 20 GBP per person. It’s a bit pricey, but there is a lot to see. There are also plenty of meal options should you choose to spend the greater part of the day here.The nearest tube stop is Tower Hill (District and Circle Lines). The tube, the underground, the metro, the subway…whatever you call it, it’s been getting people around London quickly and efficiently for years. 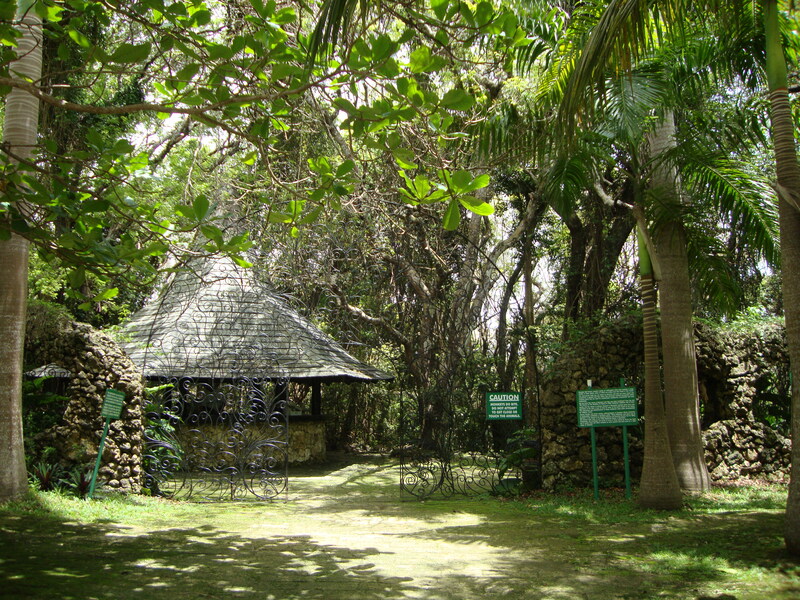 In fact, it was even used as a nighttime shelter during World War II! Londoners rely heavily on this mode of transport, because it is extraordinarily well-connected and easy to navigate. There are 11 interconnected lines, which are each color coded differently. If you are flying into London from Heathrow Airport, you can travel from the terminal to downtown via the Piccadilly Line. Whether you plan to be in London for one day or a week, I highly recommend using the tube to get around. I recommend purchasing an “Oyster card”. It will hold your prepaid fare and is scanned each time you take the tube. You can buy one of these at any station and top it up whenever you’d like. One word of advice: make sure you factor transportation costs into your budget when coming to London. 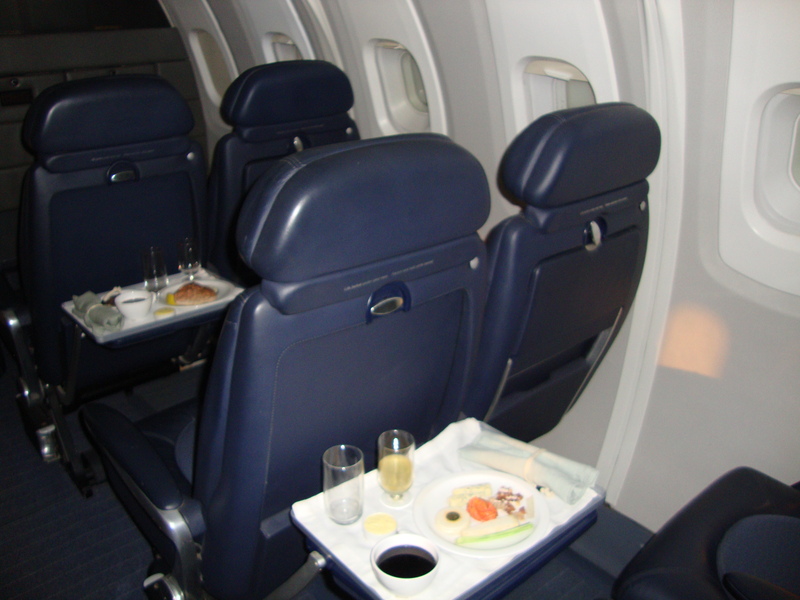 The fares can get pretty expensive if you are traveling with more than one person. Here is the current Underground fare chart. I can’t recommend whether or not you should pay as you go or purchase the travelcard because it will vary depending on your individual needs and which zones you will be traveling in. We personally chose the pay as you go option, and it cost us around $150 total for 6 days in all 9 zones. 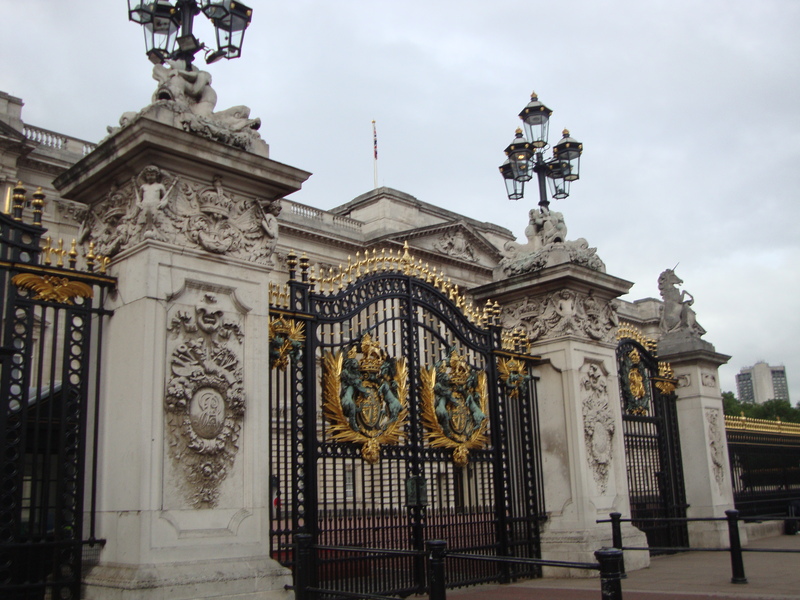 During the months of August and September each year, Buckingham Palace opens its doors to the public. 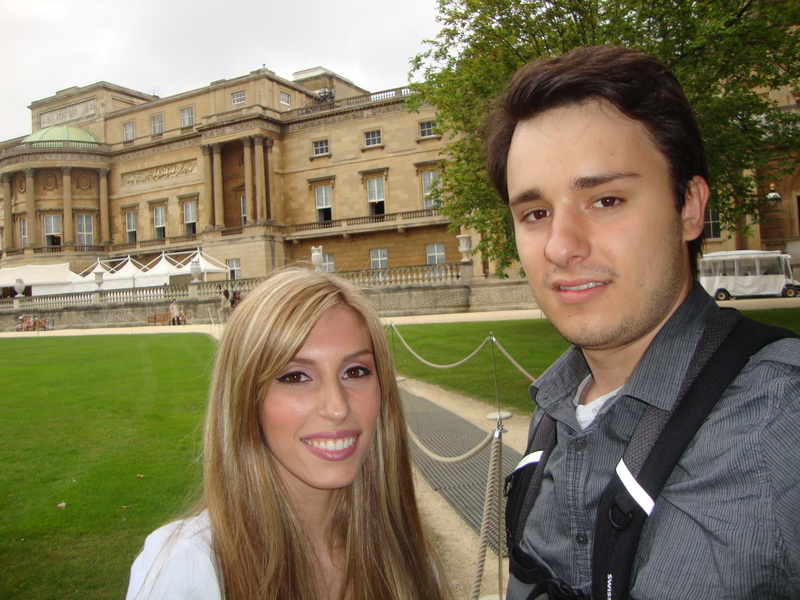 Since Alex and I were in London celebrating our wedding anniversary in August, we had the opportunity to go and visit. 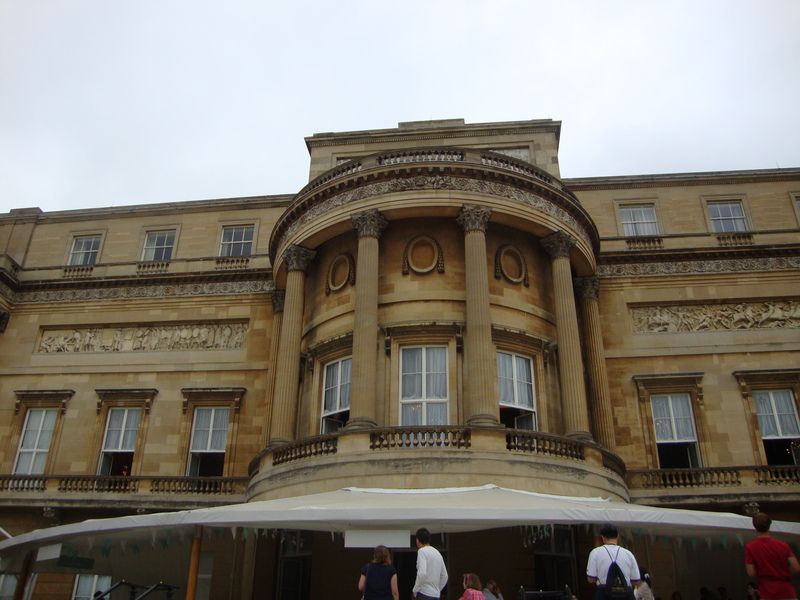 The tour of Buckingham Palace includes a visit to the State Rooms and garden. 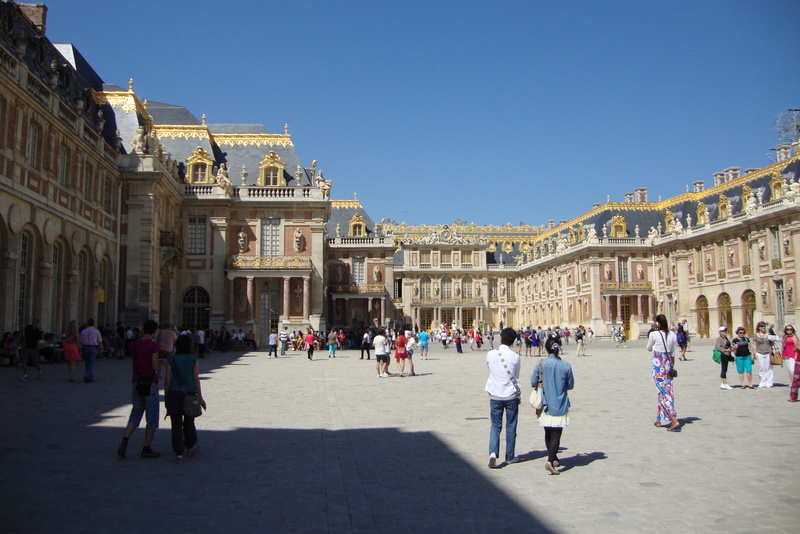 The private residences of the royal family are not accessible whether or not they are in residence at the time. If you are curious as to whether or not the Queen is present during your visit, just look at the flag on top of the Palace. 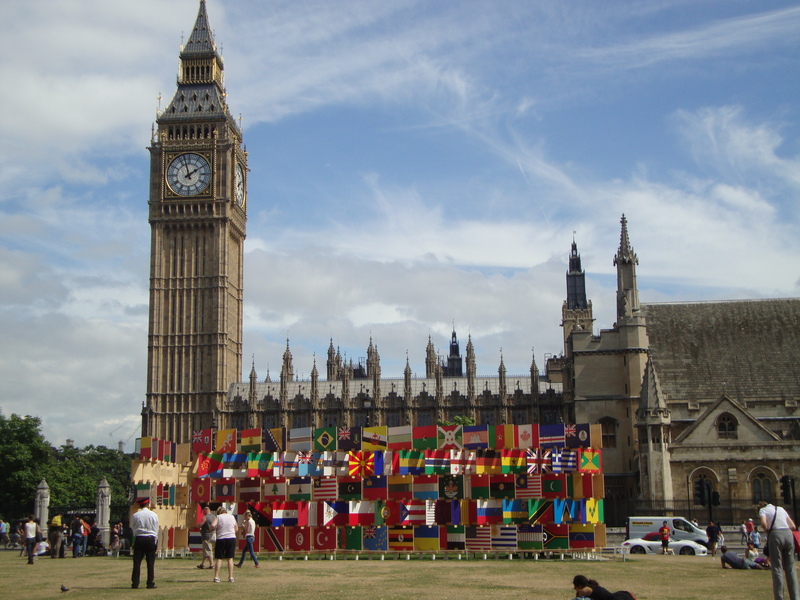 If it is the British flag, she is not there, and if it is the Royal Standard, she is. When we visited, the British Flag was flying. 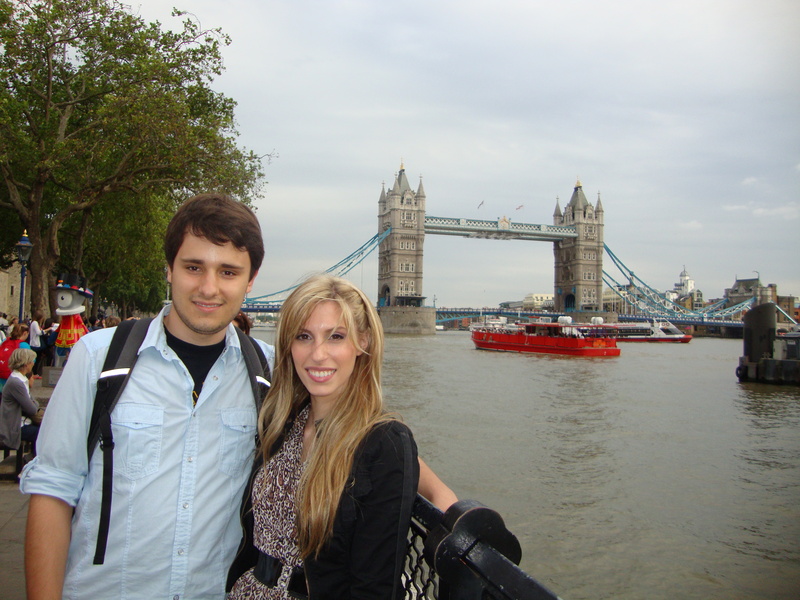 The cost of the tour was around 20 GBP per person, which roughly translates to around $32. 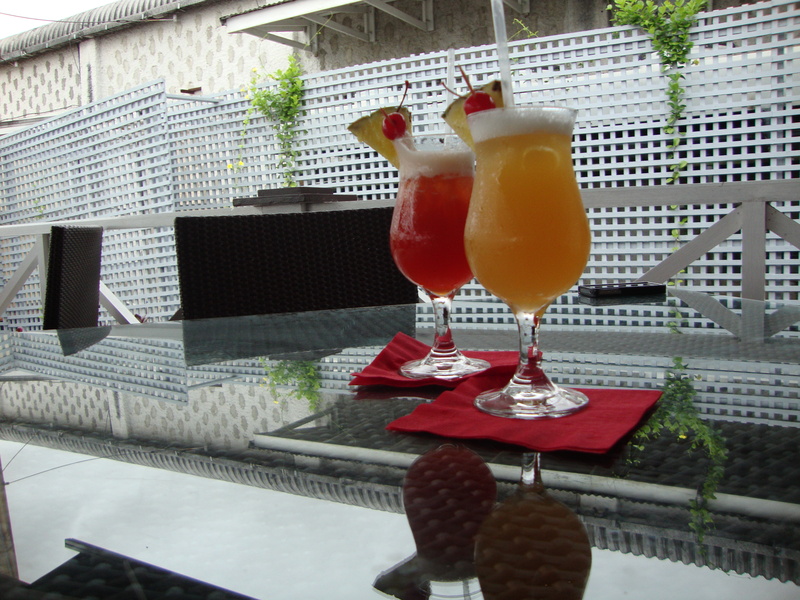 When booking online, you will see that there is limited space for each time slot. I thought this meant that it was fairly exclusive due to space limitations, but apparently it is not. I was stunned to see a line wrapped around the palace for the same entry time. It will be PACKED when you arrive, but this shouldn’t deter you from booking tickets. 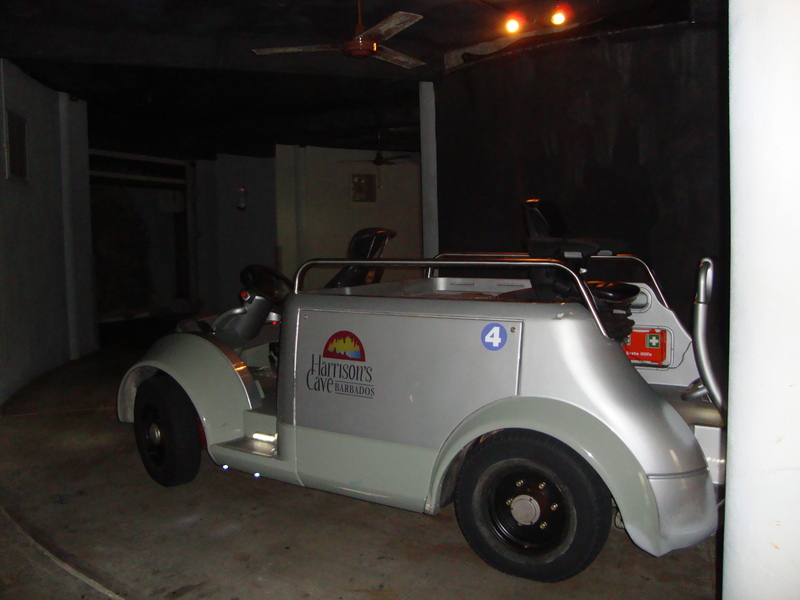 The tour itself is self-paced and comes with an audio guide, so you can mosey around at your leisure. The crowd breaks up once you are inside the palace. 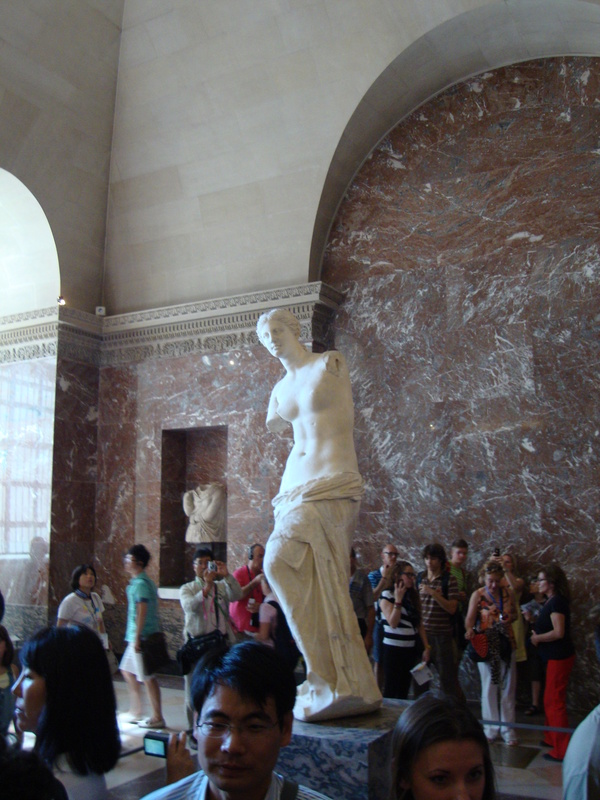 We were not allowed to take photographs once inside, so unfortunately I can only share my experiences with you. 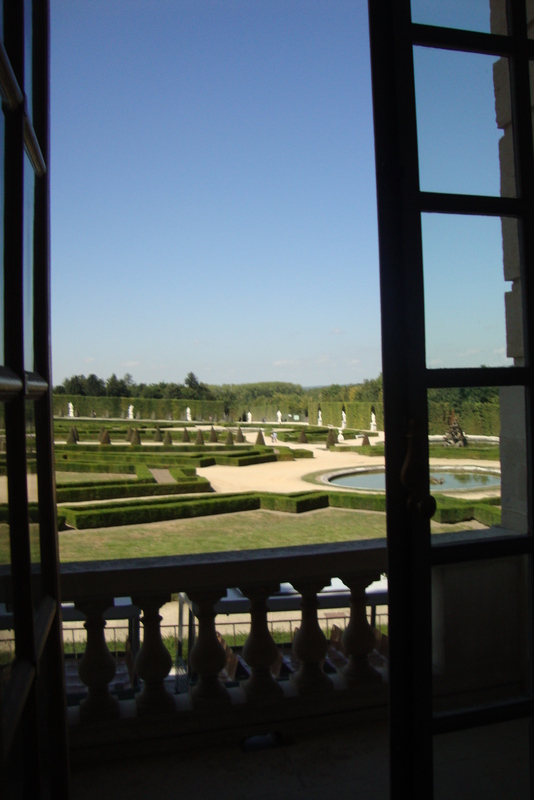 We initially entered the palace through the side entrance and traveled through several corridors towards the state rooms. 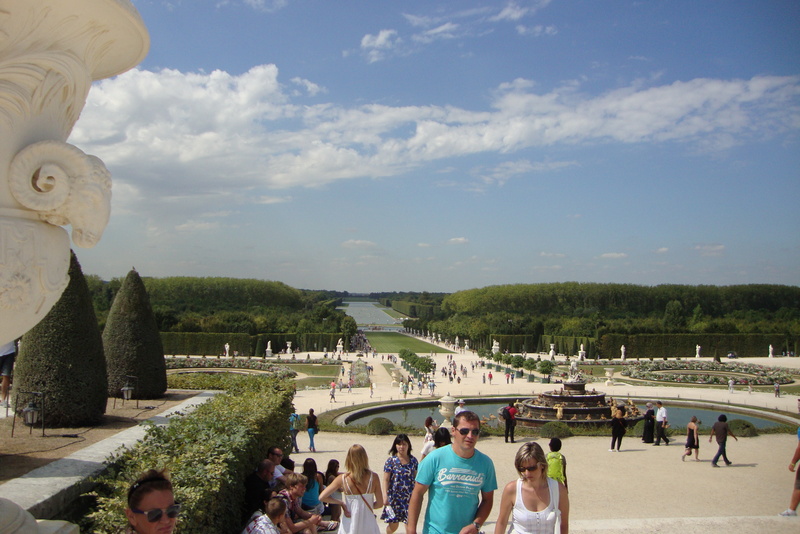 On the way, there is a large viewing deck on the quadrangle, which is basically the interior courtyard. This is where all the cars go when they enter the palace. Since it’s a working palace, it’s not unusual to see activity here of some sort. Moving on, we visited the state rooms. 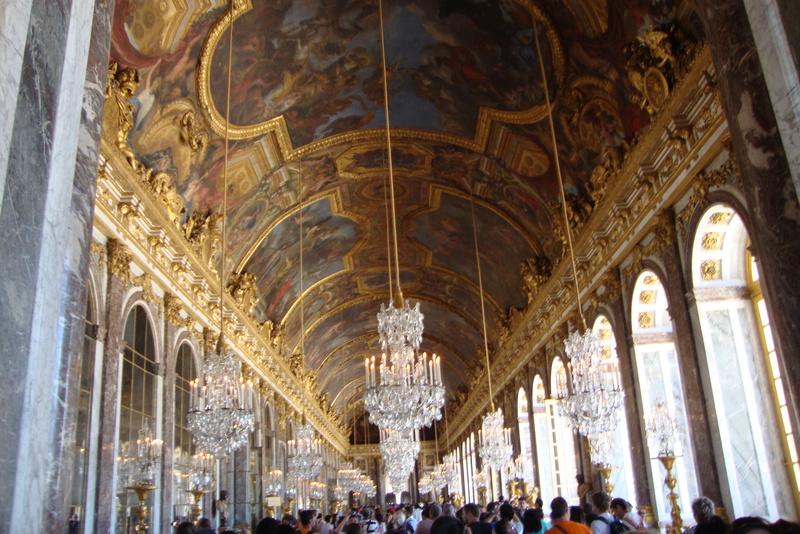 The most “famous” room is the bright red throne room where William and Kate took their official wedding portraits. 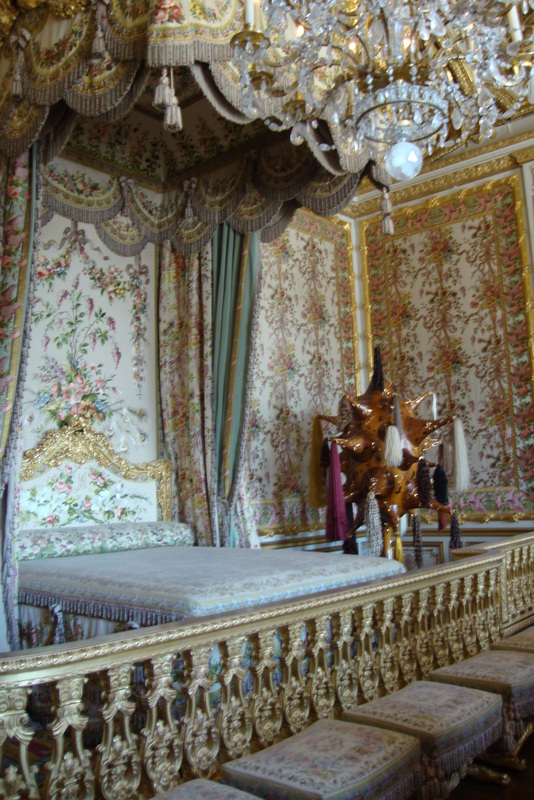 Each room had it’s own color scheme distinguishing it from the rest and were all very beautiful and ornate. All in all, we spent between 2 and 3 hours walking in and around the Palace. They also have a great souvenir shop on the way out, selling “official” royal items. I would also recommend trying to see the Changing of the Guards before or after your visit. The British Monarchy’s Official Website will have up to date information on dates and times. It’s a very big ceremonial tradition and is always intriguing to watch. As far as logistics of getting to Buckingham Palace, your best best is to get off the Tube at either Victoria Station or St. James’s Park (Circle and District Lines). 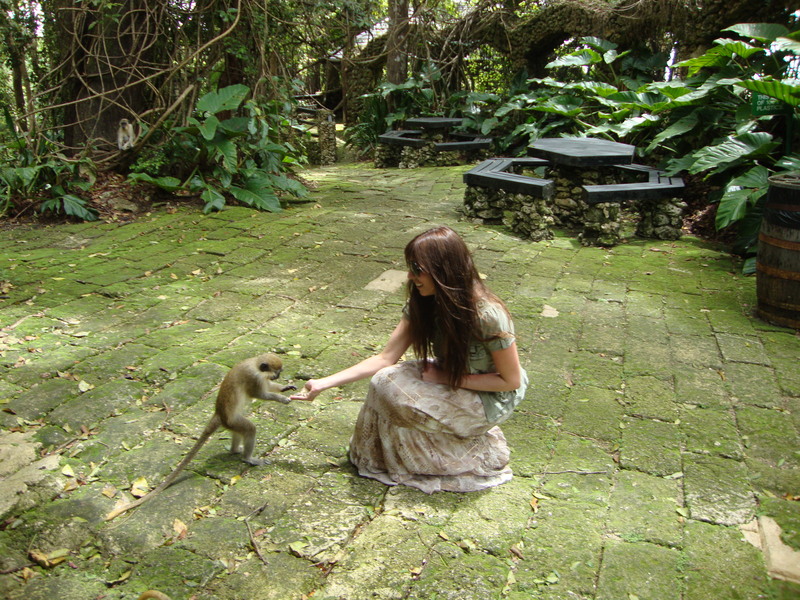 The major thing that drew me here was getting to see and feed the green monkeys. Up until this point, I’d only seen monkeys in cages at the zoo, so this was a really unique opportunity. 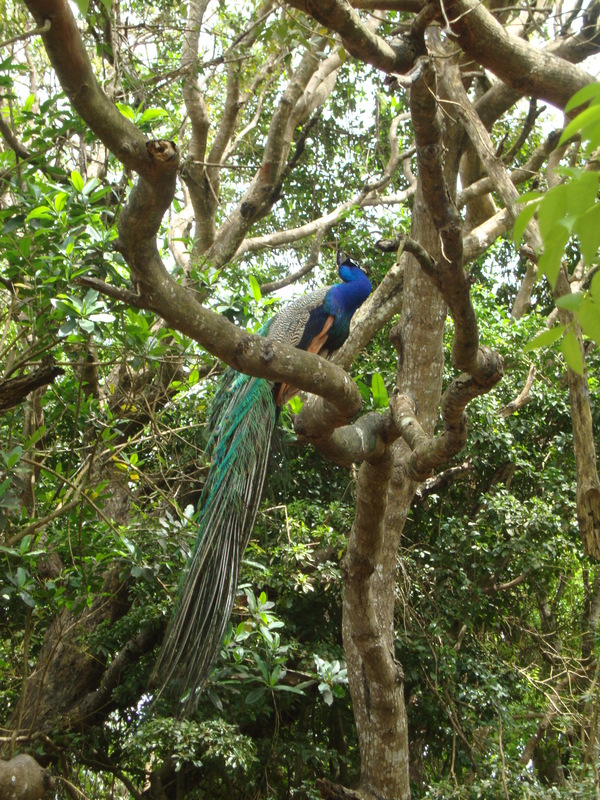 Many of the animals (excluding reptiles and certain birds) have free reign to roam around the reserve. If you go at 2pm, which we did, you can feed the monkeys. The employee instructed me to hold out my hands with the food he provided, and reminded us not to pet them. 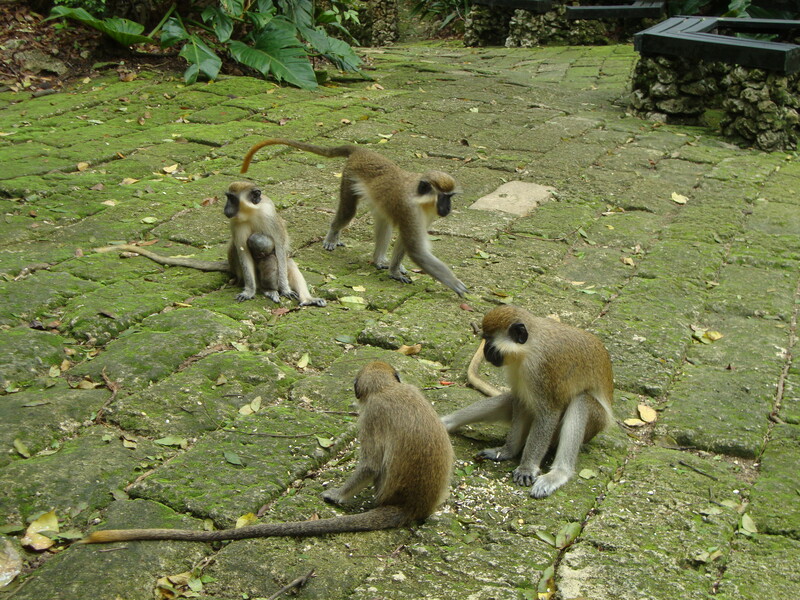 I was surprised by how many monkeys there were, maybe 10 or so. They were all very sweet, and took the food right out of my hands. I even got to see a mommy and baby monkey. 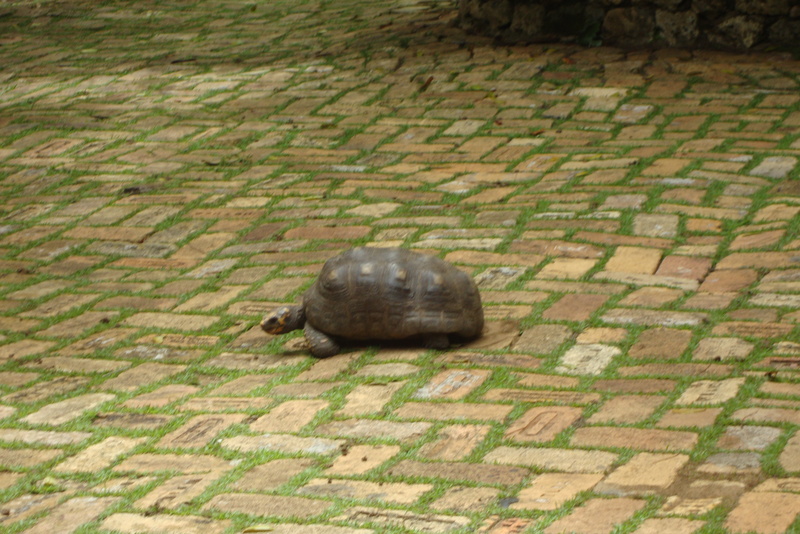 Some of the other animals at the reserve included tortoises, cats, deer, iguanas, and peacocks. Nothing too out of the ordinary, but what else could you expect if you want to walk around with them? 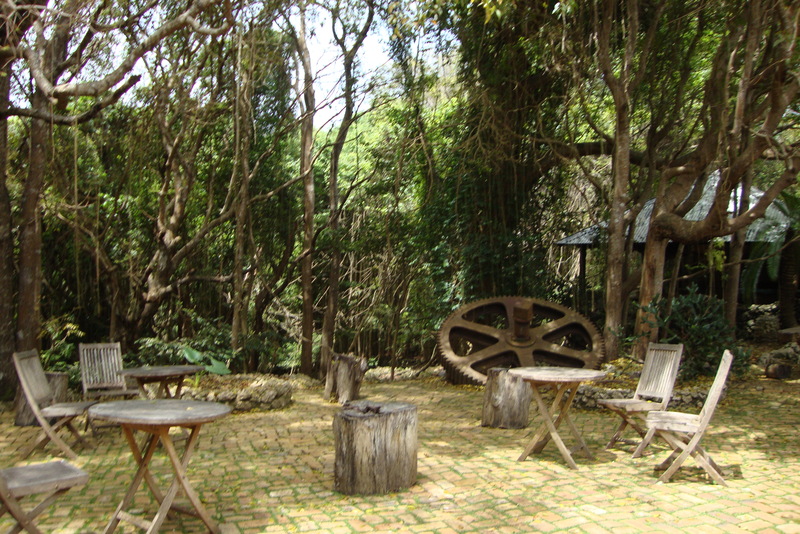 The reserve itself is so beautiful, and reminded me of a secret garden. It’s very green, lush, and overgrown, which in my opinion adds to its beauty. 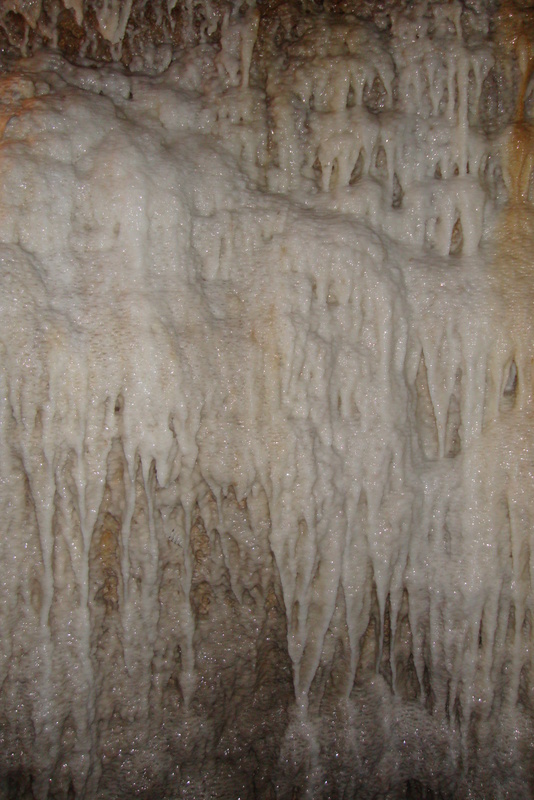 You should definitely make a stop at Harrison’s Cave if you are interested in geology or haven’t visited a cave before. 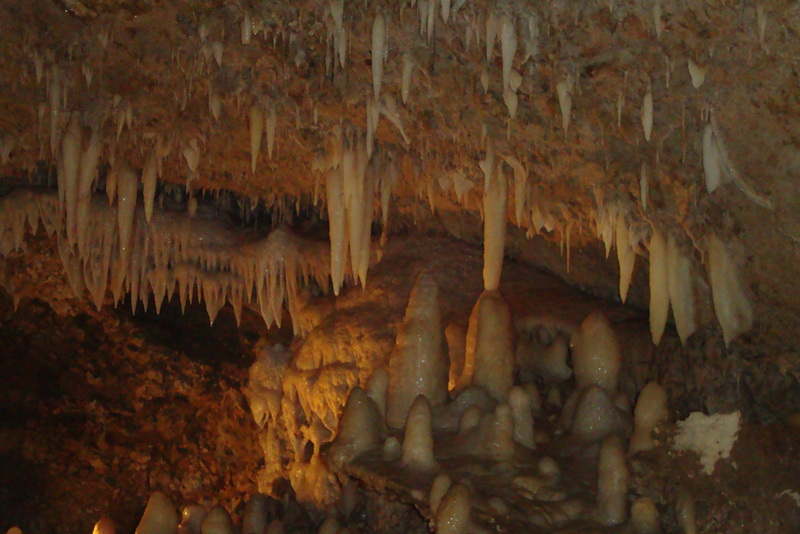 The most unique feature of this particular cave is that you can ride through it on a tram. I’ve never seen that before, so that added to the experience. There are also opportunities to stop and walk around if you wish. Before boarding the tram, you enter a building where you get to learn a bit about the formation of the island (which was not formed by volcanic activity but rather by colliding plates) and the cave’s history. 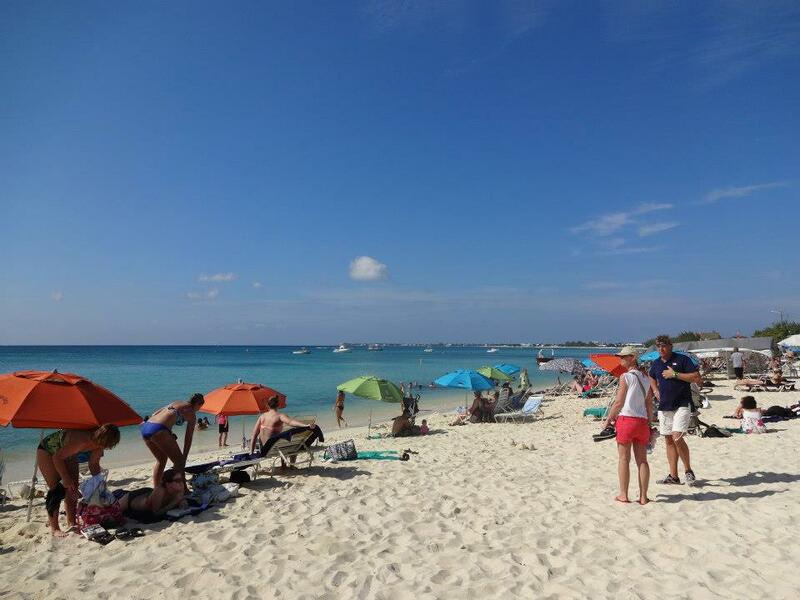 Of course, what would a trip to the Caribbean be without enjoying the turquoise waters? On the advice of our hotel’s concierge, my Dad and I booked a catamaran tour. The company, called Cool Runnings, picked us up at the hotel and drove us down to Bridgetown, where we boarded the catamaran. We swam with the turtles, snorkeled at a shipwreck, and had some free time at a secluded beach (NOTE: all beaches in Barbados are public, but no one was there due to it’s accessibility). Overall, vibe of the tour was a lot of fun: the music was awesome and the other people on the cruise were friendly and easygoing. 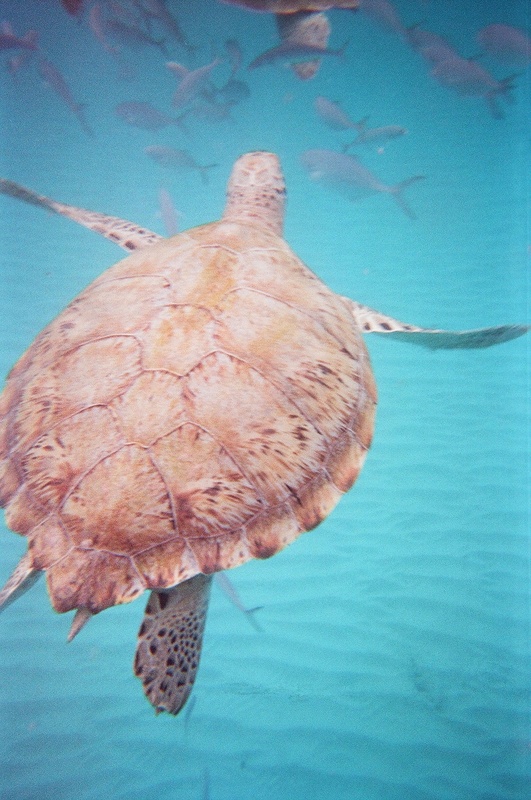 The first stop on our day cruise was swimming with sea turtles. 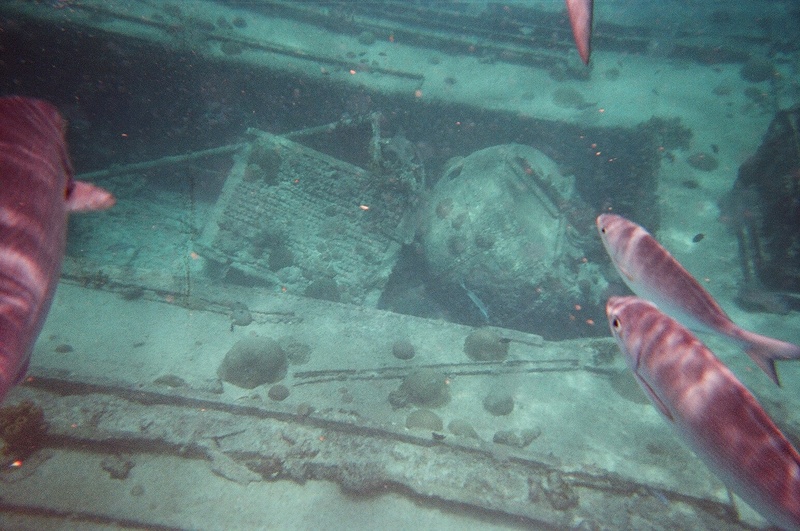 I was nervous around them at first because there were so many, but a few of the crew members jumped in the water to make us feel more comfortable. They even fed the turtles, which kept them close. 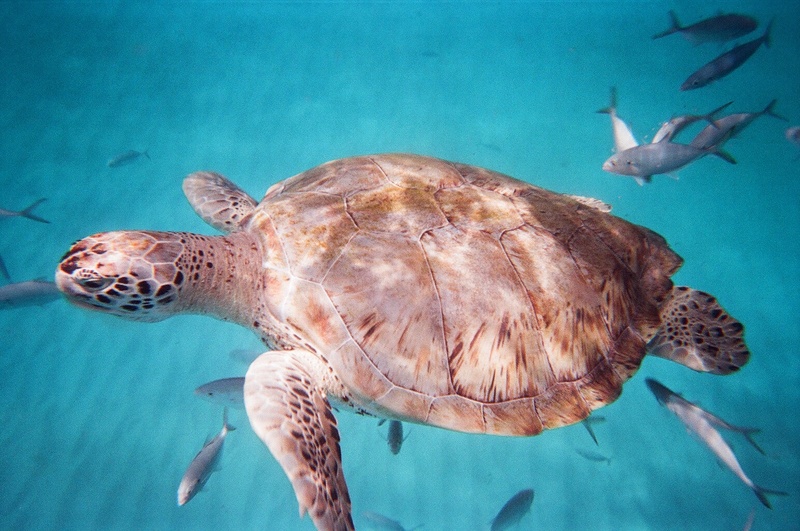 Unlike in Hawaii, it’s okay to touch the sea turtles, which I had a chance to do. You can see how close they are in my pictures; it would have been difficult to avoid touching them completely anyway. 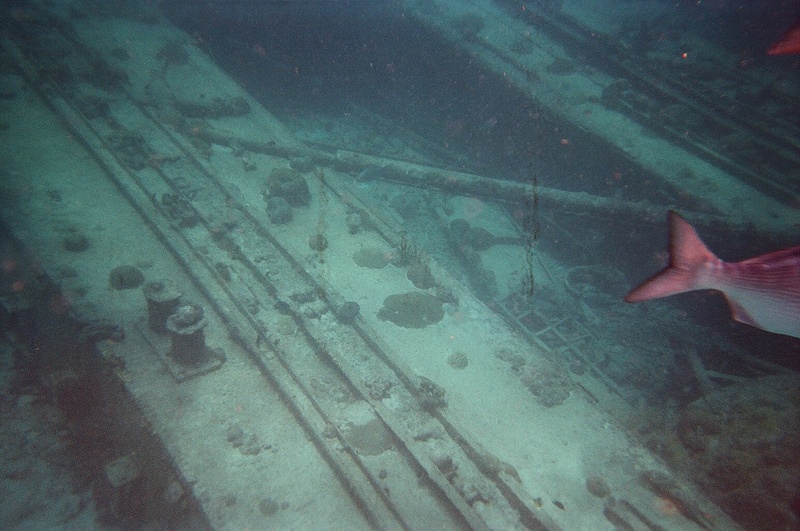 Snorkeling around the shipwreck was also very interesting. 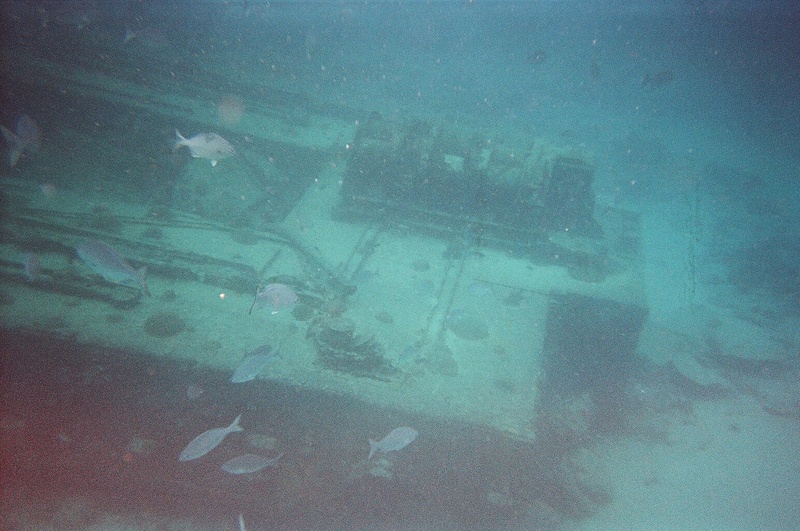 Shipwrecks are a bit creepy to me because they are sometimes underwater graves, but I doubt this was the case here since it was only a few hundred yards from the beach. As a bit of a history buff, I do wish they had more information about what caused it and when, but either way it was cool to see up close. In addition to the swimming and time on the beach, we had an excellent buffet lunch. 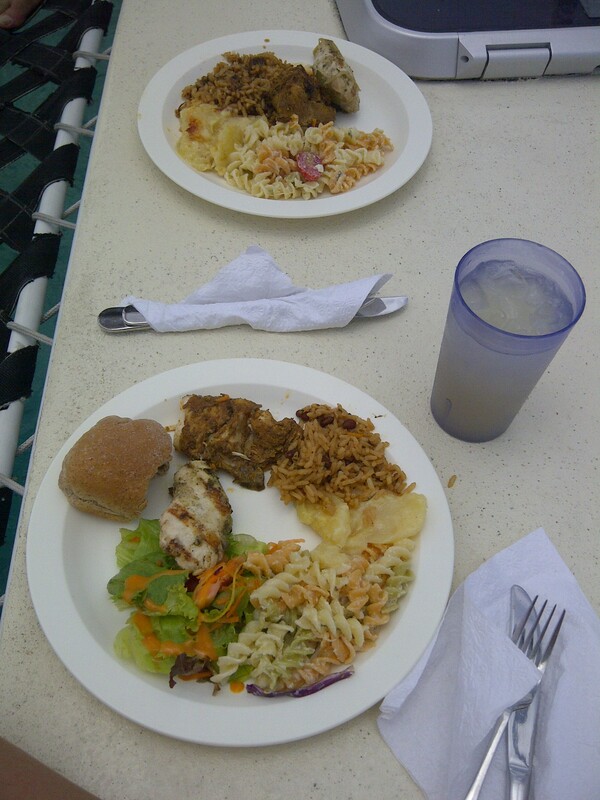 They gave us mahi mahi, jerk chicken, rice and beans, pasta, salad, and unlimited drinks. 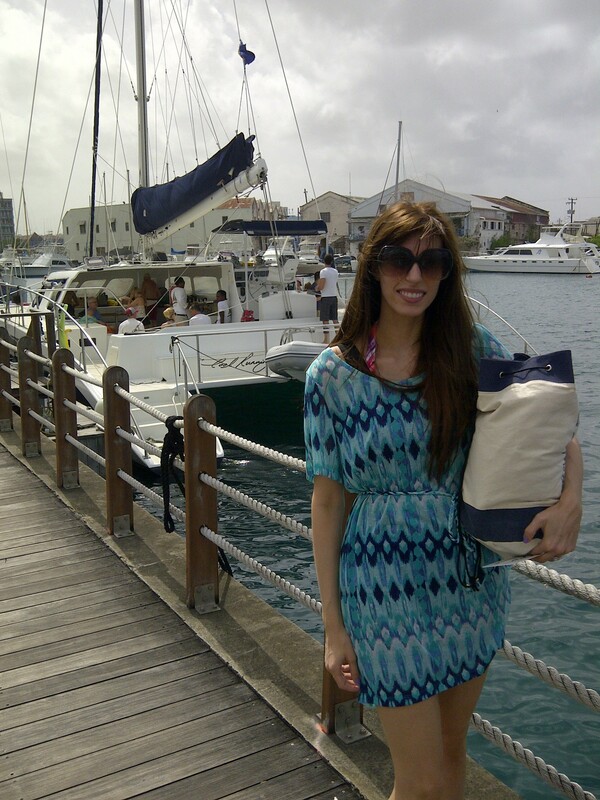 I’d definitely recommend doing a catamaran tour if you have the chance. Also, avoid ending up like me and be sure to bring your sunscreen since you will be sitting outside for several hours. I didn’t bring any with me because it was cloudy that day…what a mistake! I burned terribly and could barely move the next day. Save yourself the trauma! This actually happened while eating dinner at our hotel. We went into the restaurant expecting a late night meal, and were pleasantly surprised by the show that followed. From folk dancing to fire limbo, and a stellar performance of “Rolling in the Deep” by an undiscovered singer, this show was honestly spectacular. It was interesting, interactive, and just so much fun. 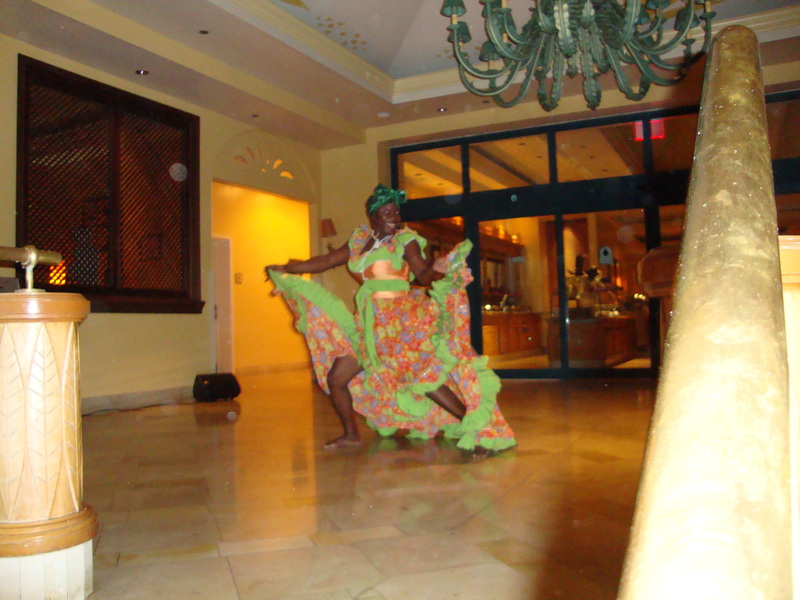 If you have the chance to see a show like this in Barbados, I would highly recommend it! Even if you aren’t an aviation enthusiast, I guarantee this will be an interesting stop! 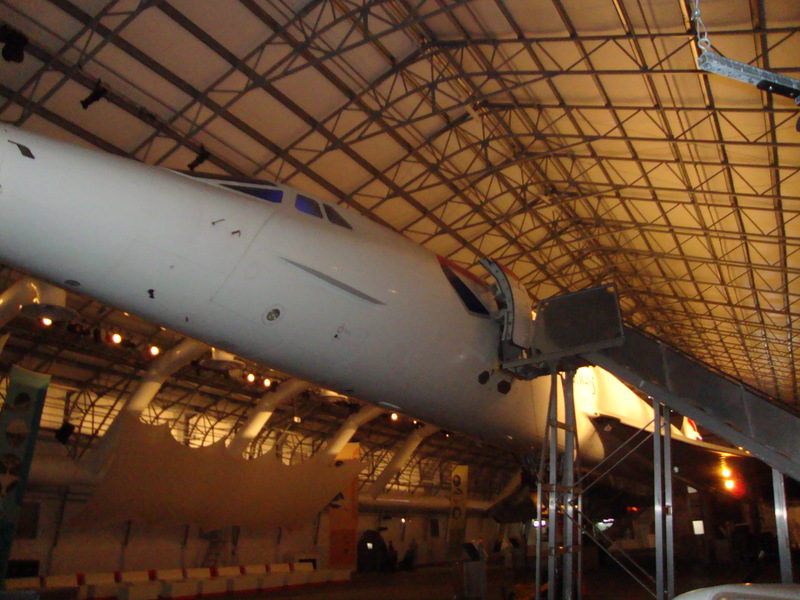 The Concorde is housed in a hangar located right next to the airport. 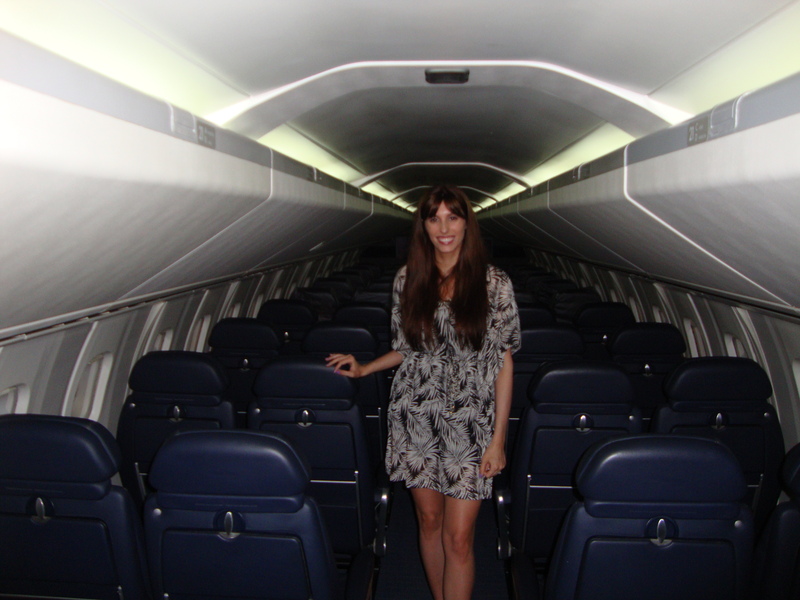 Not only can you see it up close and learn about the Concorde’s history, but you can also step right inside and feel what it was like to be on a flight. We got to walk through the plane, sit in the seats, visit the cockpit, and listen to a takeoff. Kids and adults alike would have a great time here. 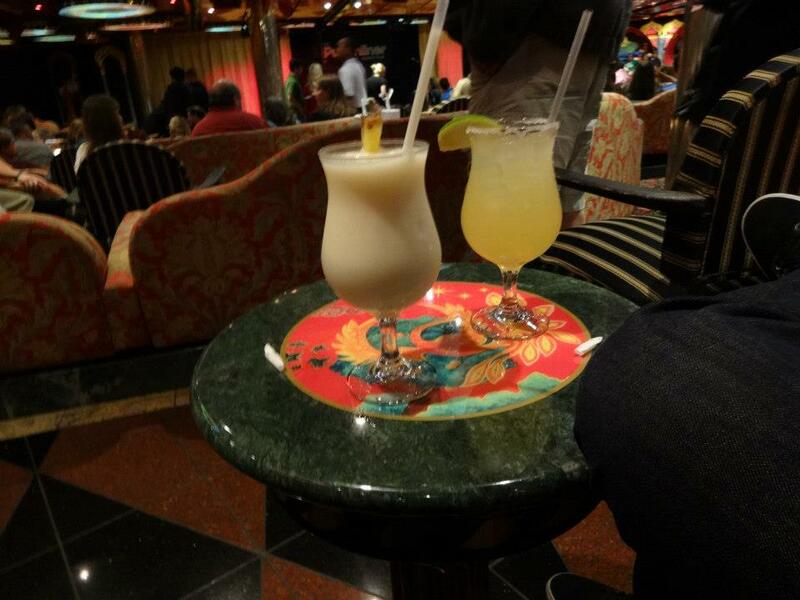 What’s a trip to the Caribbean without rum? 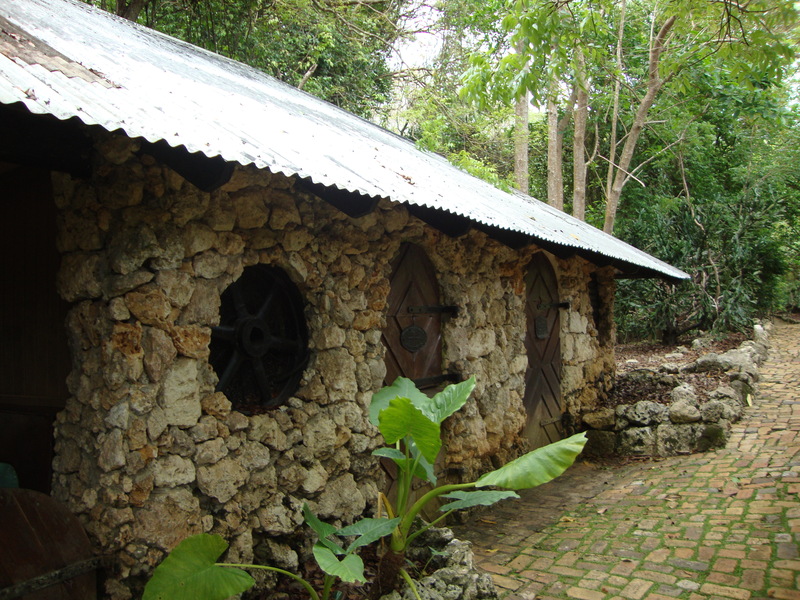 Mount Gay Rum offers a distillery tour, a rum bar, and a retail store in one convenient location. My Dad and I were a bit short on time and could not make the tour, however we did shop in the store and sat down at the bar to enjoy a drink. Not being of much a drinker myself, I wasn’t sure what to order, but the bartenders were incredibly nice and offered to create a special cocktail just for me. It was made with rum and peach schnapps, so I decided to name my drink the “Princess Peach”. 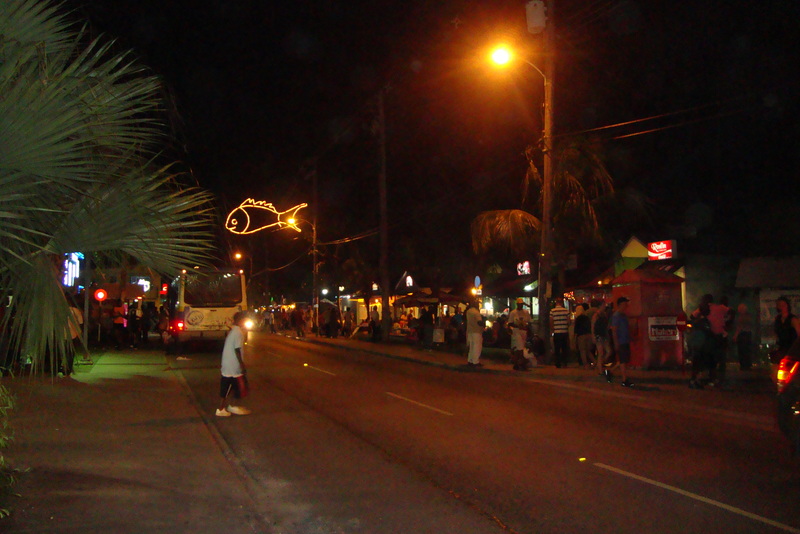 If you are here on a Friday night, make sure you don’t miss out on Oistin’s Fish Fry…it’s THE place to be for tourists and locals alike. 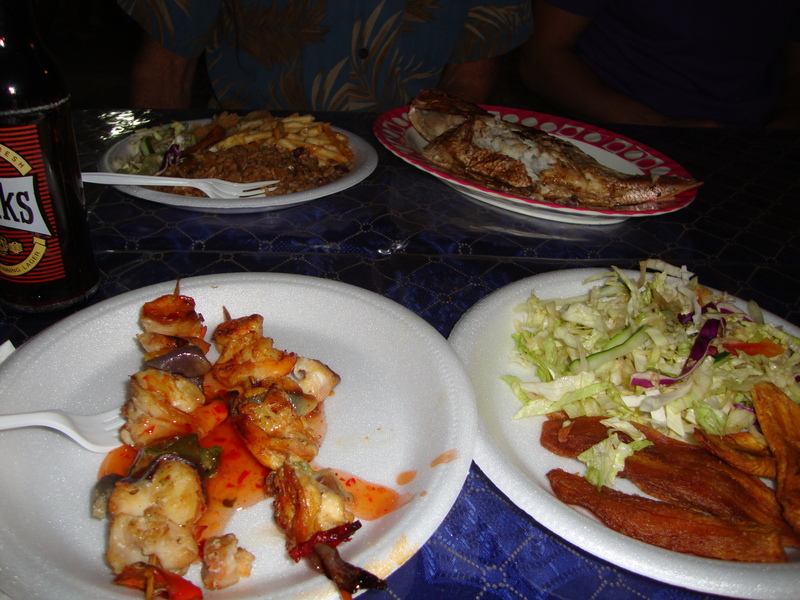 Enjoy fresh seafood, good music, and interesting company! There are dozens of vendors serving food and the seats are all cafeteria style, so expect to make new friends. The food is the main attraction, but people also come here to dance, play games, socialize, and be merry!